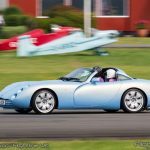 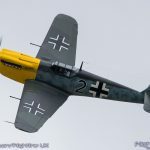 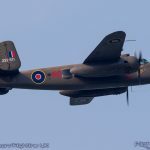 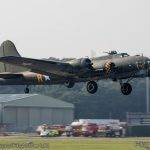 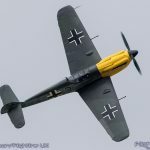 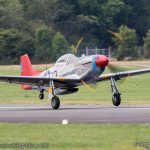 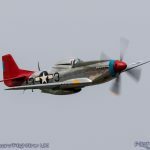 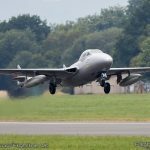 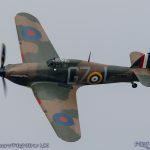 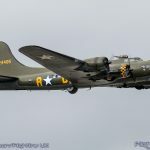 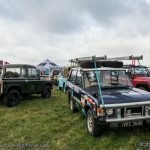 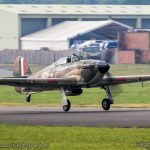 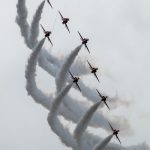 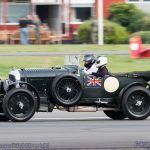 Nestled in the rolling green countryside of the Surrey-Sussex border, Dunsfold Aerodrome played host to the 12th Wings and Wheels over the August Bank Holiday. 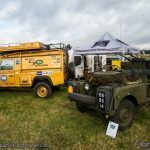 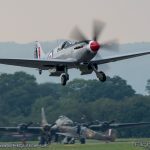 Organised by the enthusiastic staff of Dunsfold Park, the event supports the Help for Heroes Charity and Brooklands Museum and has its own unique atmosphere that attracts visitors from far and wide every year. 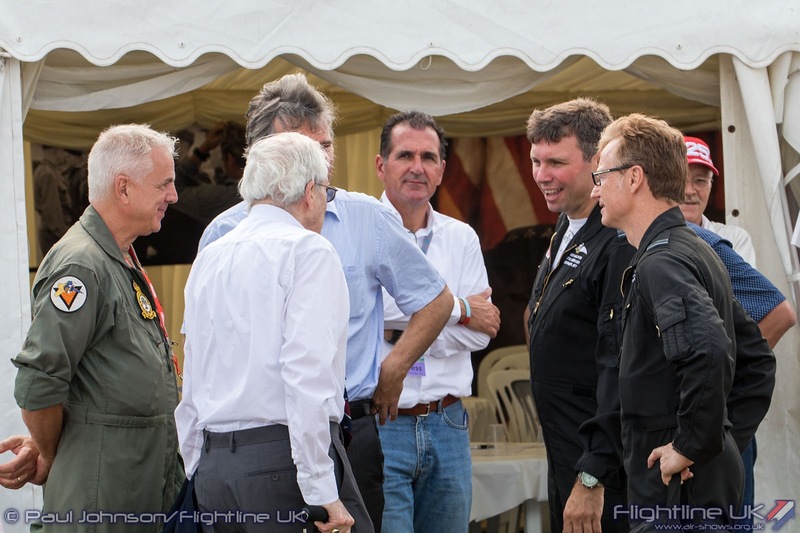 This year also saw the event host a reunion for the members of 320 Squadron, a Royal Netherlands Air Force unit that was for a time based at the airfield during the period of the D-Day landings. 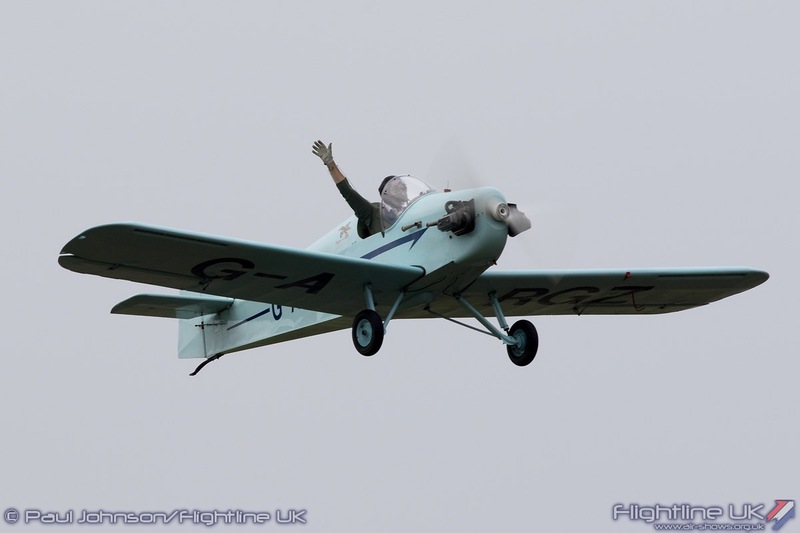 Just 9 miles south of Guildford lies Dunsfold Aerodrome. 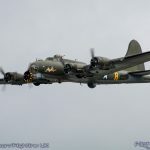 Built by Canadian personnel during the Second World War, it has been home to fighter and bomber squadrons, a maintenance facility and also played an important role in the Berlin Airlift. 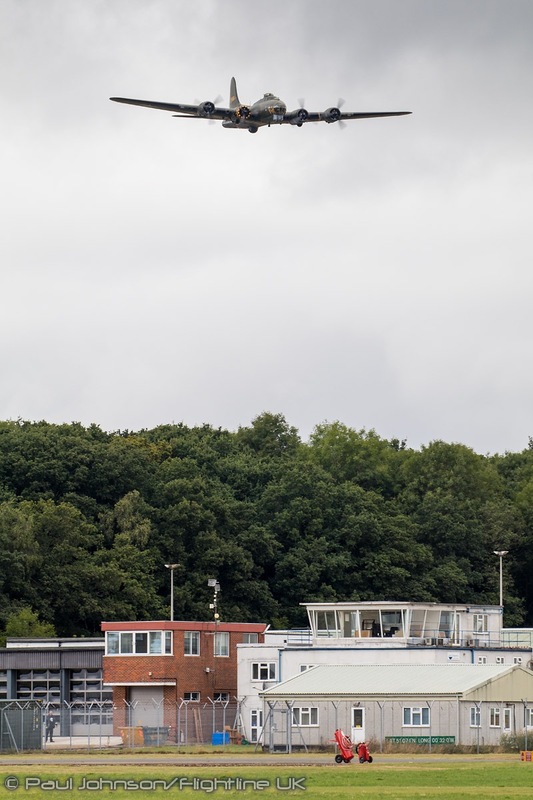 It however is perhaps best known as the home of the Harrier. 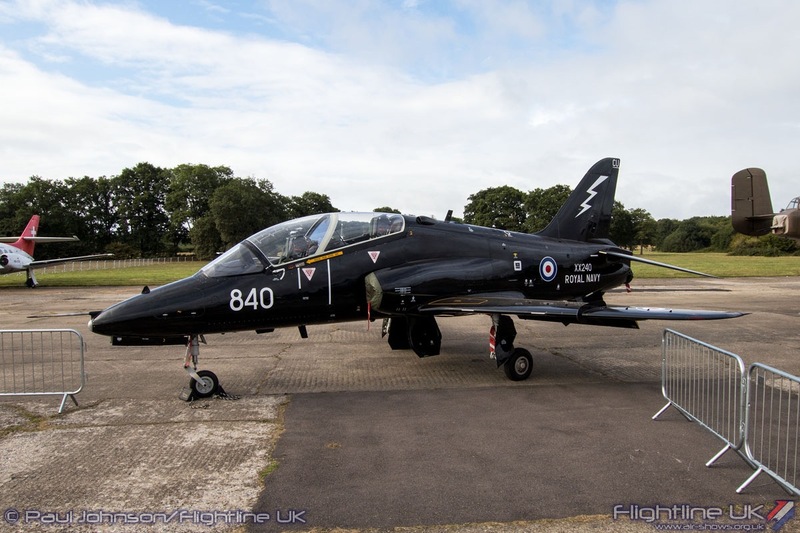 Hawker Sidderley and latterly British Aerospace tested and developed the Harrier Jump Jet at the secretive Surrey airfield until the facility was closed in 2000. 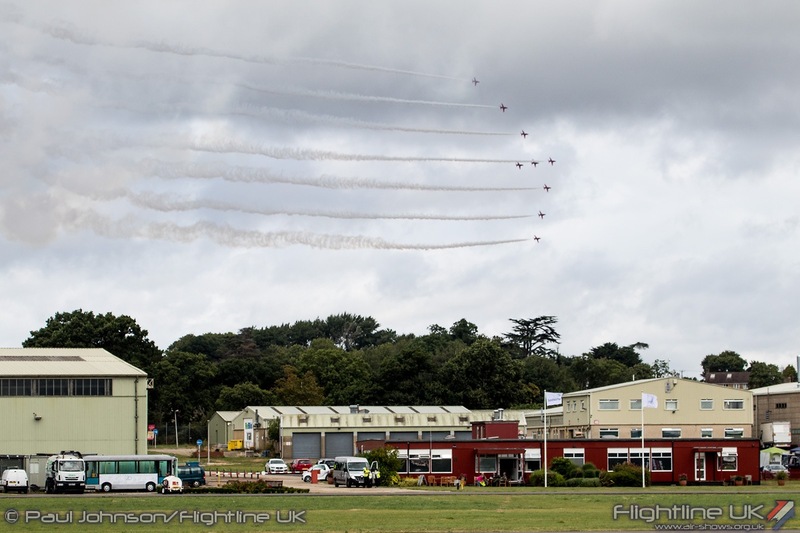 Today, the airfield is managed by Dunsfold Park as an industrial site and civilian aerodrome. 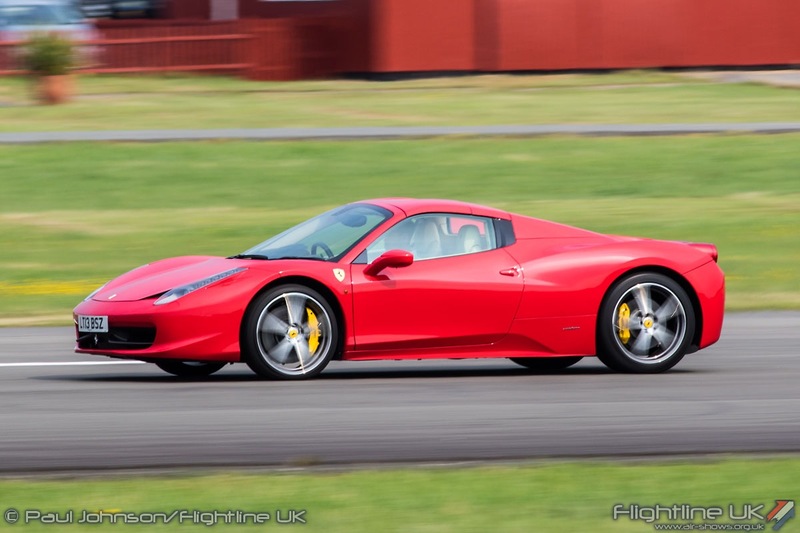 In it’s current guise, it is best known as the home of BBC’s Top Gear television series which has its studio and test track on the airfield. 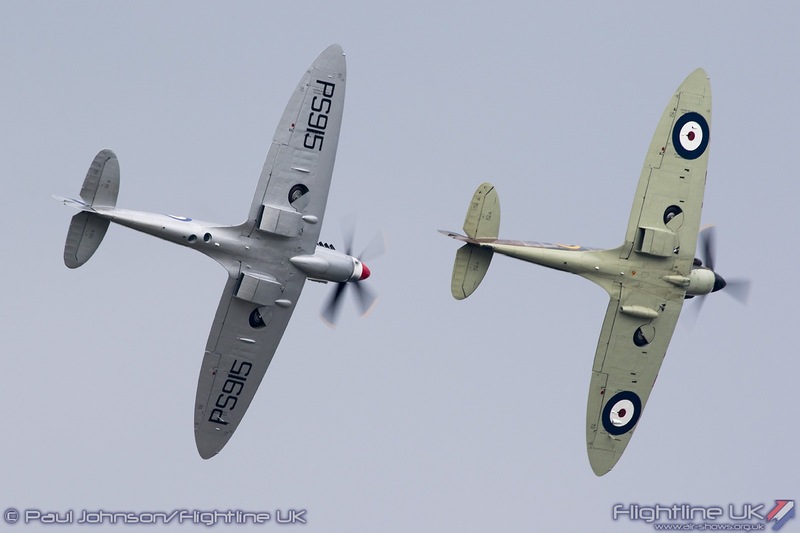 In 2004, Dunsfold Park held its first Wings and Wheels. 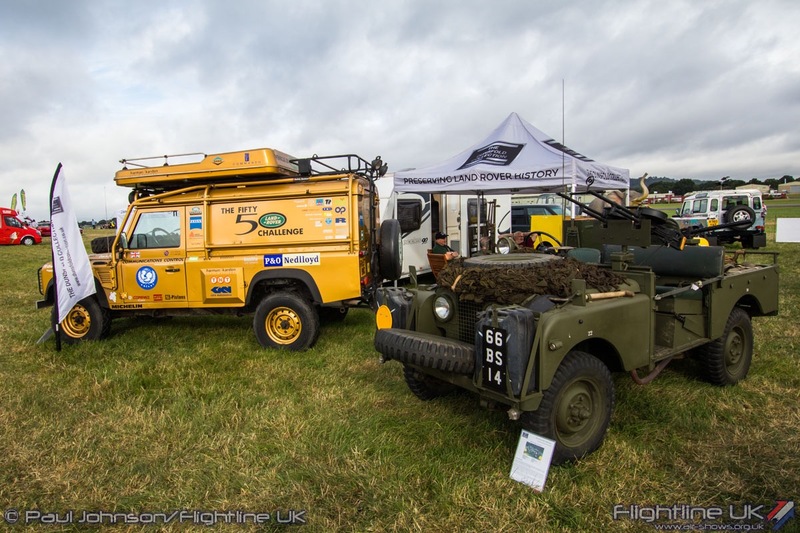 What started as a small one day event has grown into a two day extravaganza of motoring and aviation action. 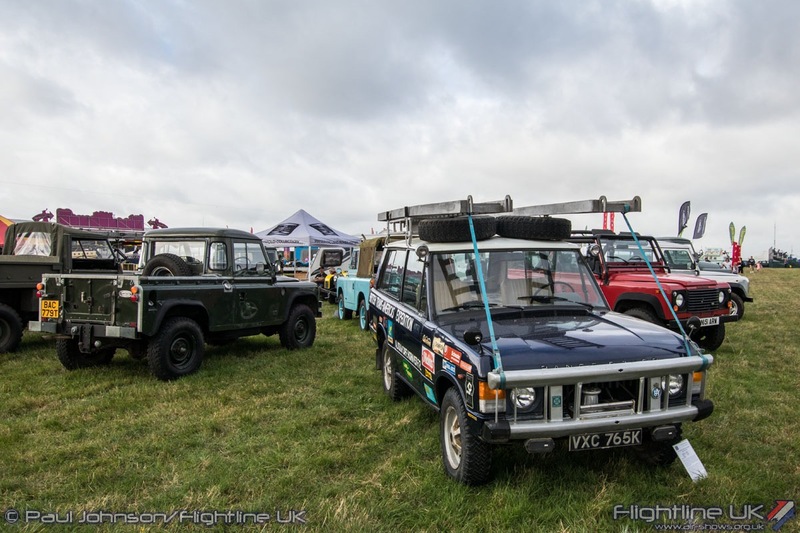 While the event has grown, it has not lost its trademark atmosphere that makes it a ‘must-do’ event for so many. 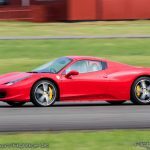 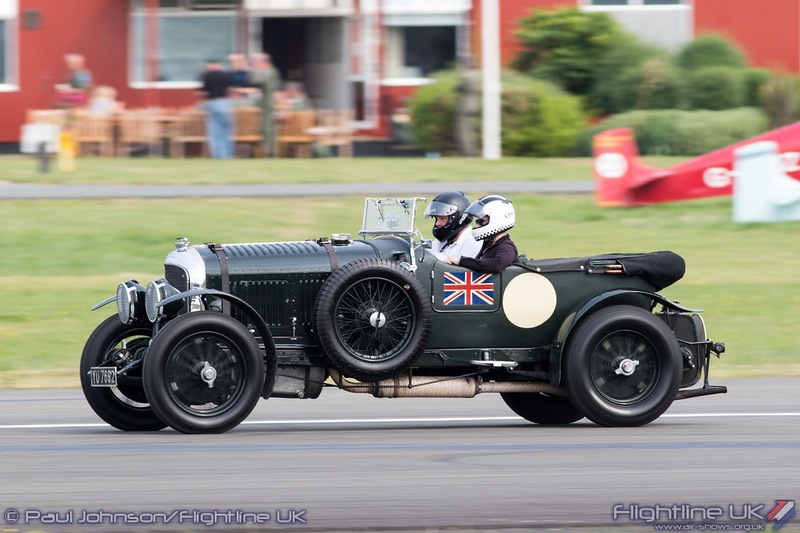 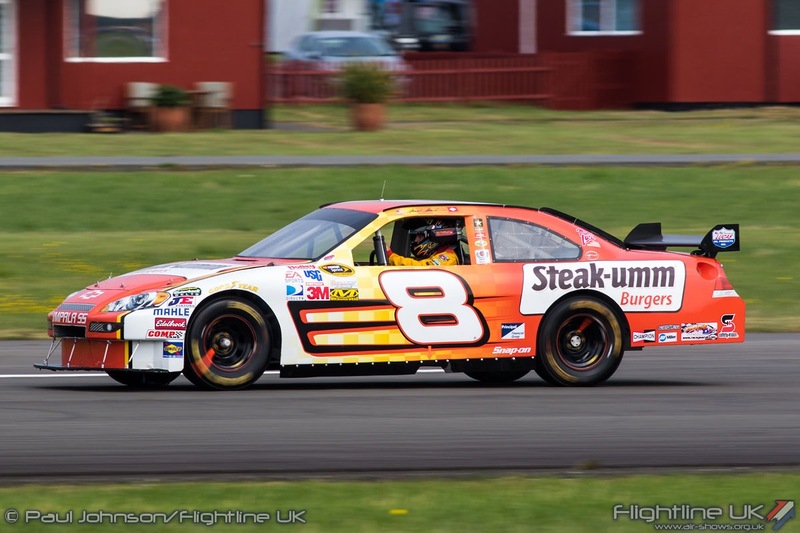 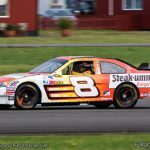 Dunsfold remains a very professionally run, yet relaxed event with the emphasis on fun and entertainment. 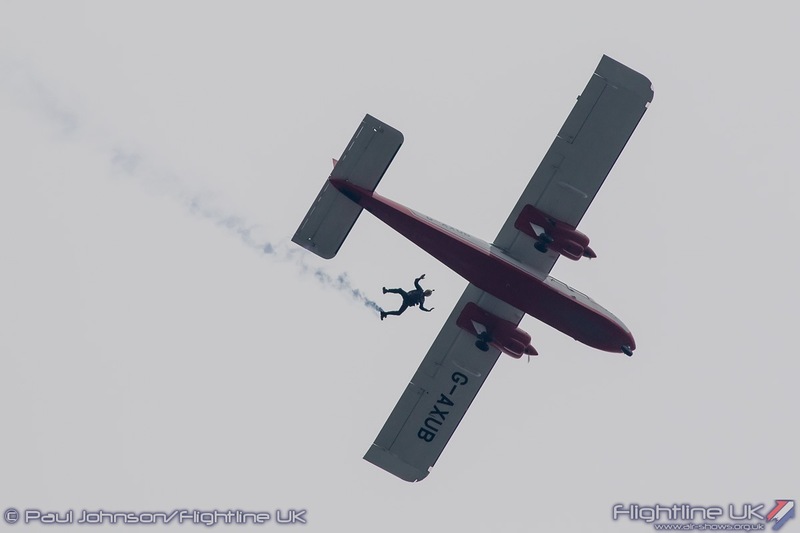 From the moment the gates open until they close in the evening there is always something going on be it stunt shows or live music. 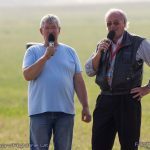 That atmosphere also owes a lot to the aviation commentary team of Melvyn Hiscock and Brendan O’Brien who beautifully mix facts, emotions and humour throughout the flying displays. 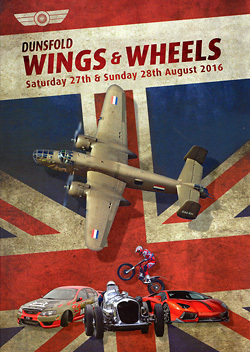 Both the ‘Wings’ and ‘Wheels’ elements take equal billing during the day. 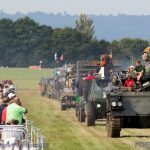 Military vehicle and classic cars were paraded down the crowd line during the day and there are further arenas for stunt driving. 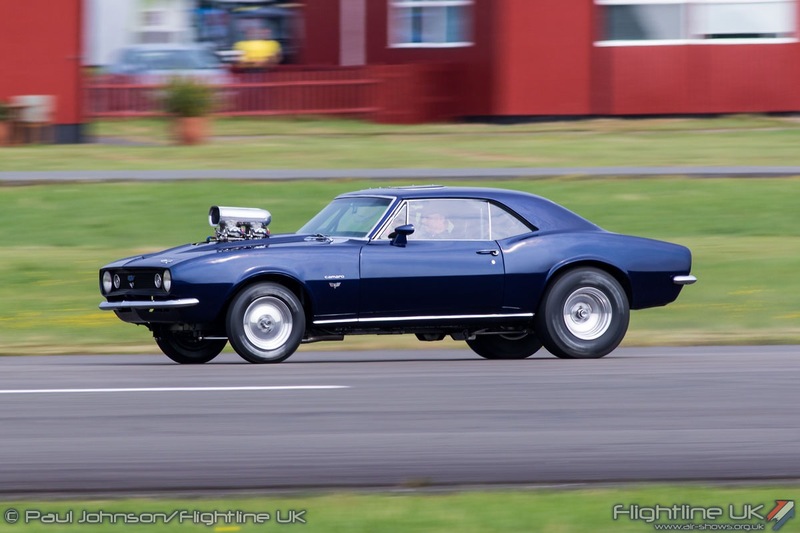 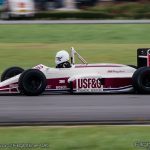 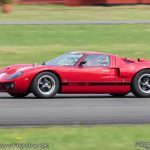 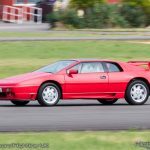 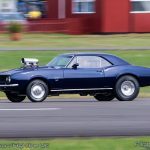 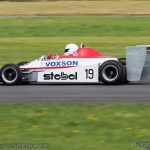 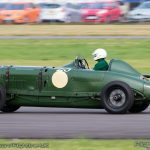 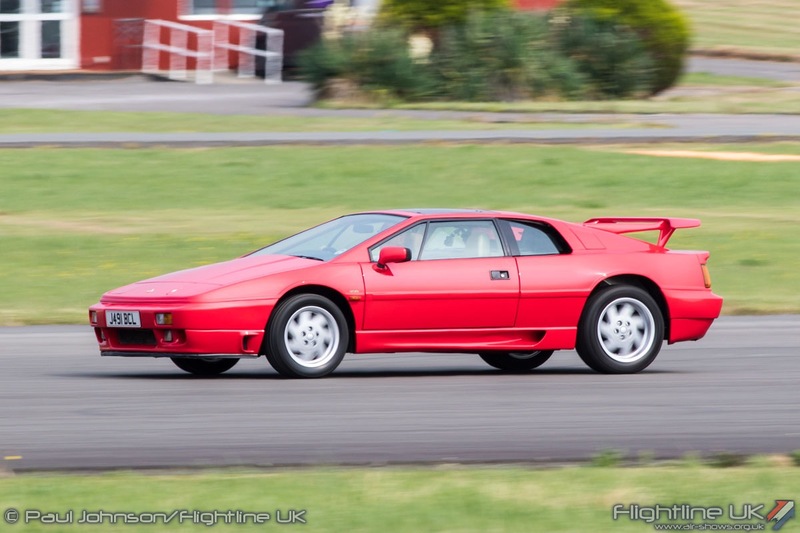 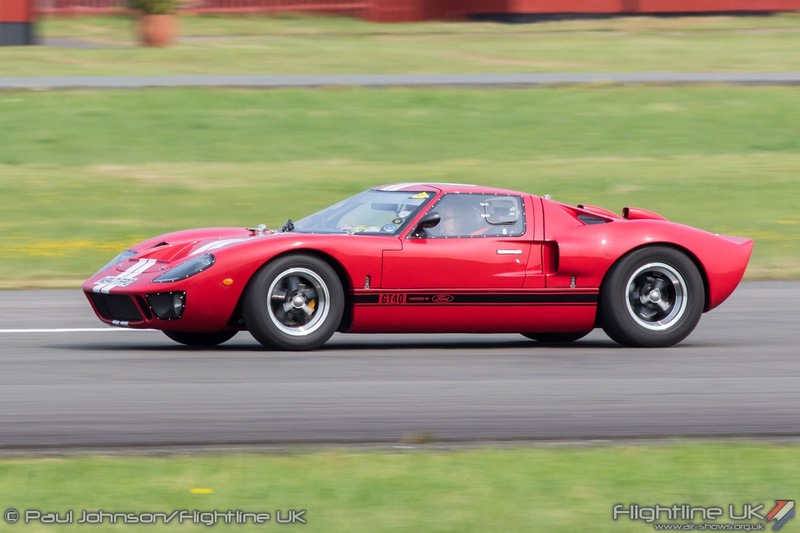 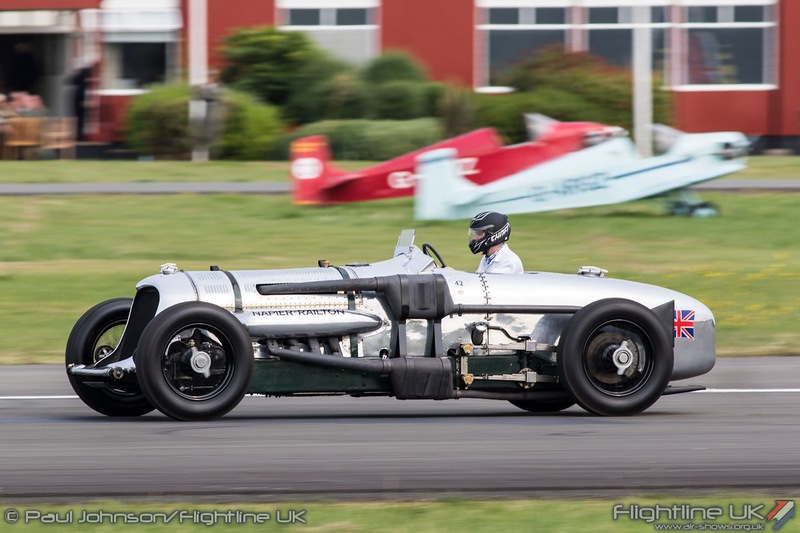 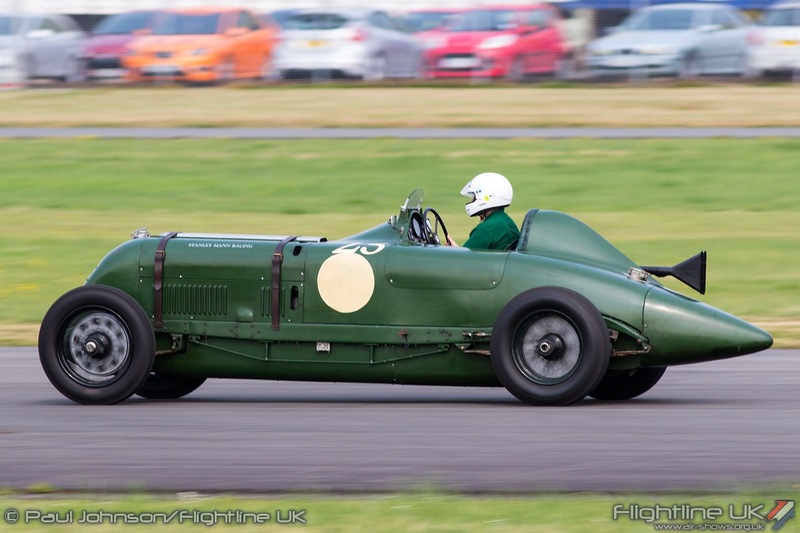 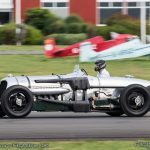 There are also two “Motoring” demonstrations on the main runway allowing some historic and modern cars to chance to show their true performance to the crowd. 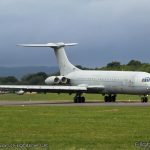 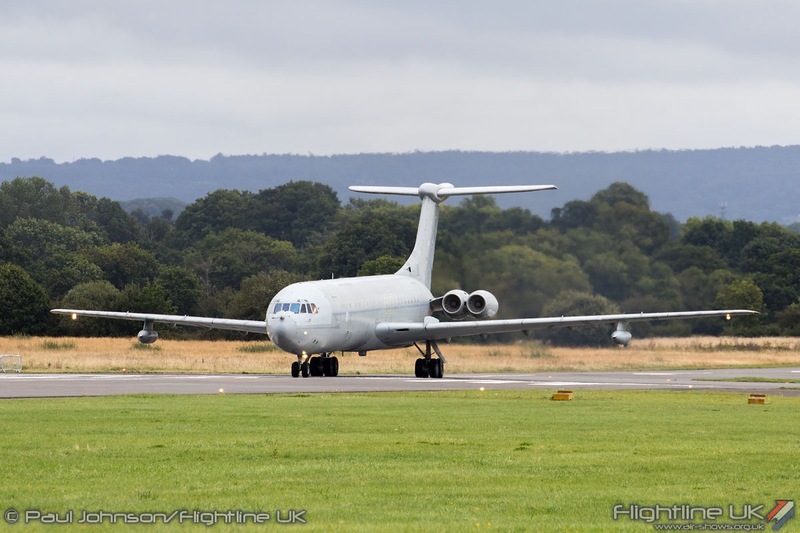 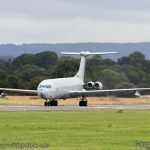 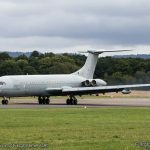 On the Sunday, the “Wings” element of the show started very early with a taxy demonstration by Brooklands Museum’s live BAC VC-10K3 tanker ZA150. 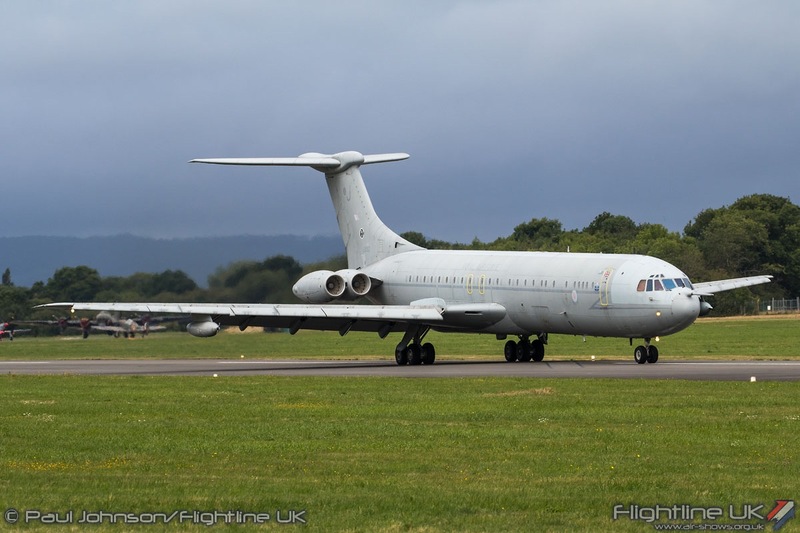 Retired to Dunsfold in late 2013, this VC-10 was the last produced at the Brooklands site. 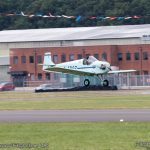 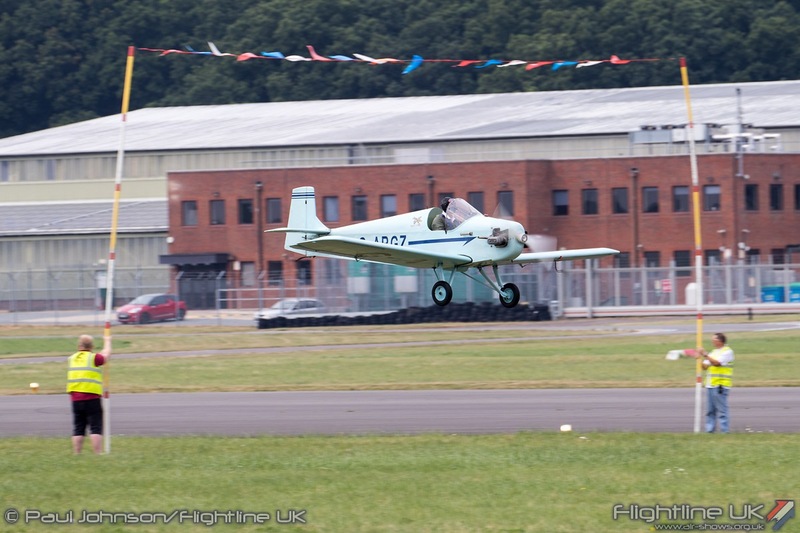 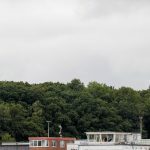 Brooklands Museum’s staff have kept the aircraft live and do run the aircraft up and down Dunsfold’s runway with Wings and Wheels providing them the opportunity to show off the aircraft to the public. 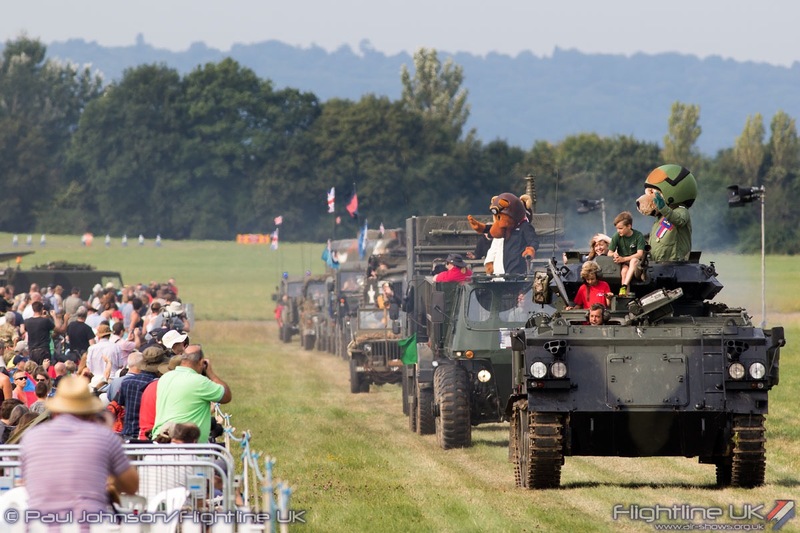 Dunsfold traditionally enjoys good support from the armed services. 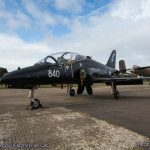 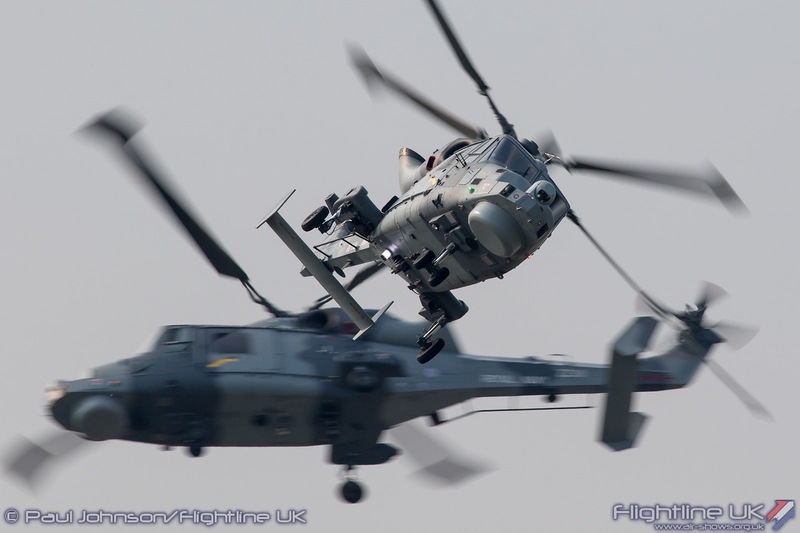 This year saw a welcome boost to the static display from both the Royal Air Force and Royal Navy. 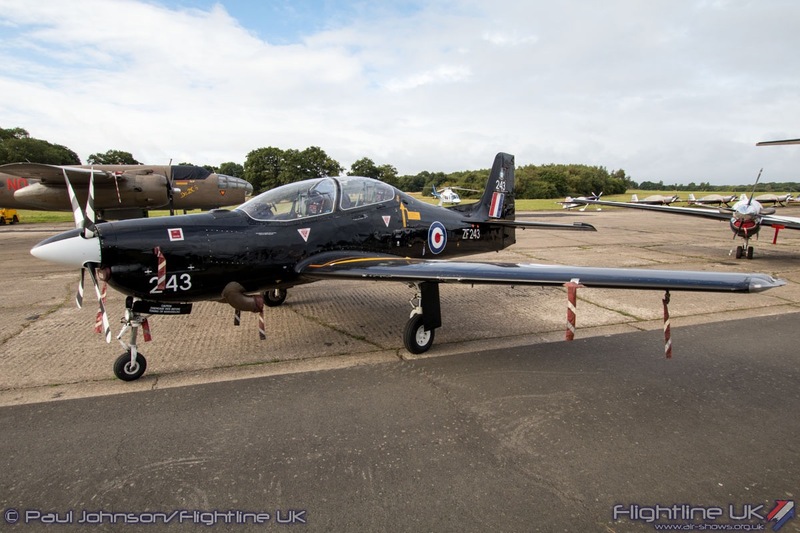 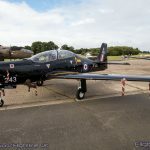 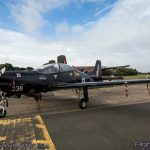 No 72[R] Squadron sent a pair of Shorts Tucano T1s while 45[R] Squadron had their Beechcraft King Air B200 on display wearing Squadron Centenary markings. 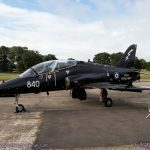 The Royal Navy continued the training theme was a 736NAS BAE Systems Hawk T1 on display alongside an AgustaWestand Merlin HM2 from RNAS Culdrose. 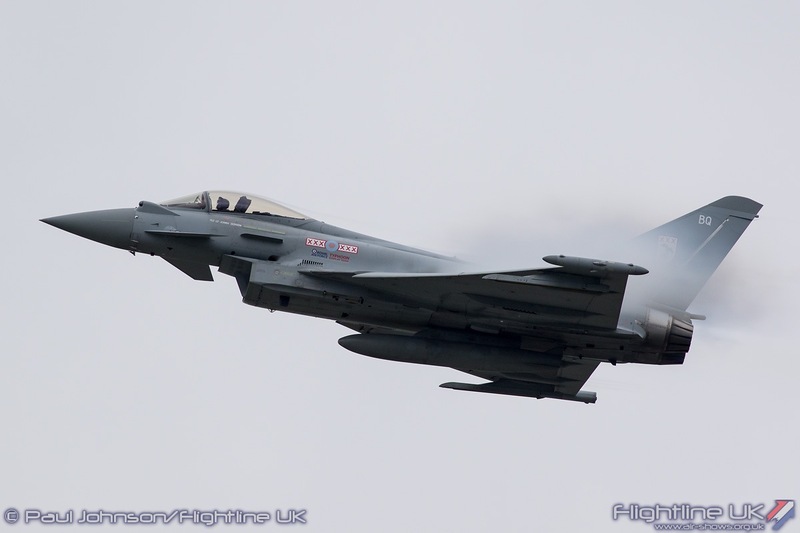 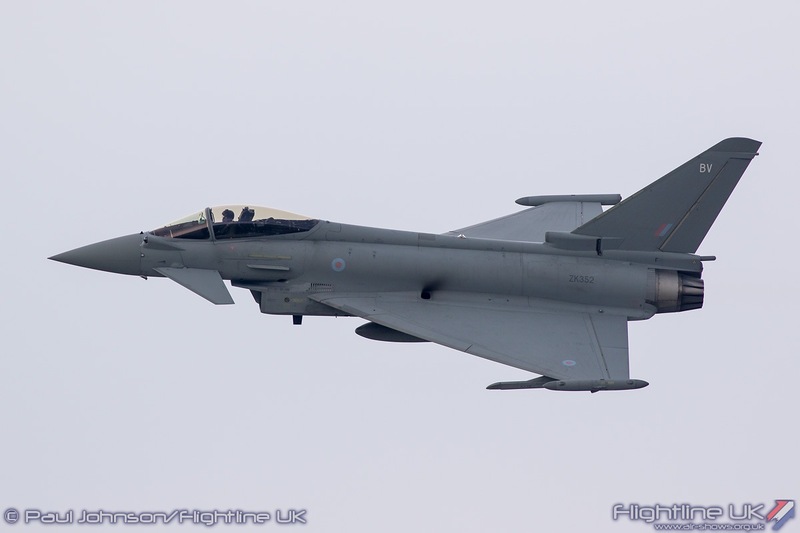 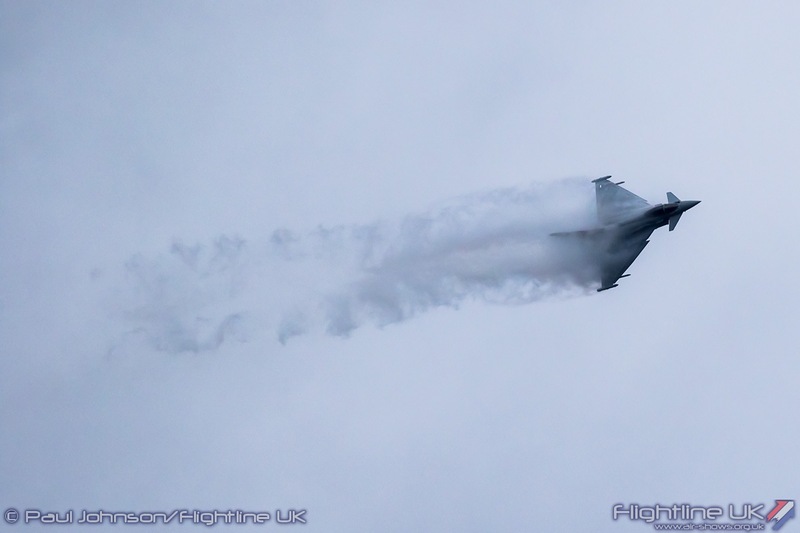 In the air, the Eurofighter Typhoon FGR4 flown by Flt Lt Mark Long represented the front-line Royal Air Force. 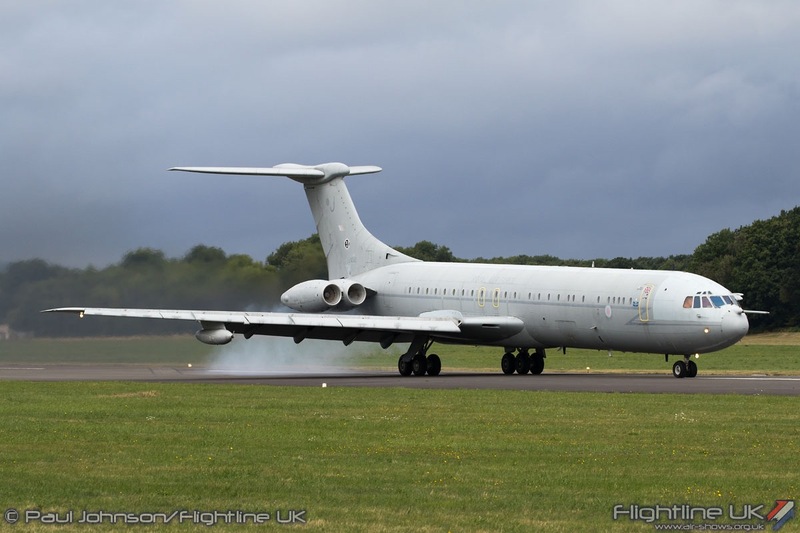 Dunsfold is an interesting site for an airshow as it sits close to Gatwick Airport. 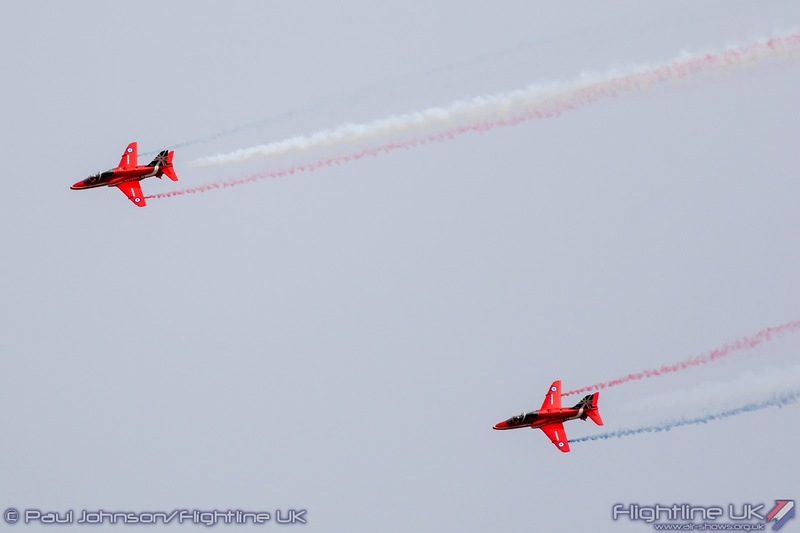 This limits many of the displays and meant that Mark flew his flat display on both days. 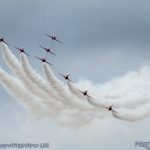 Complicating things further on Sunday was some poor weather which brought with it some very low cloud which clung to the hills either side of Dunsfold. 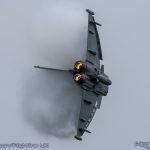 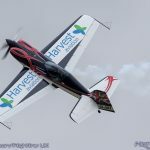 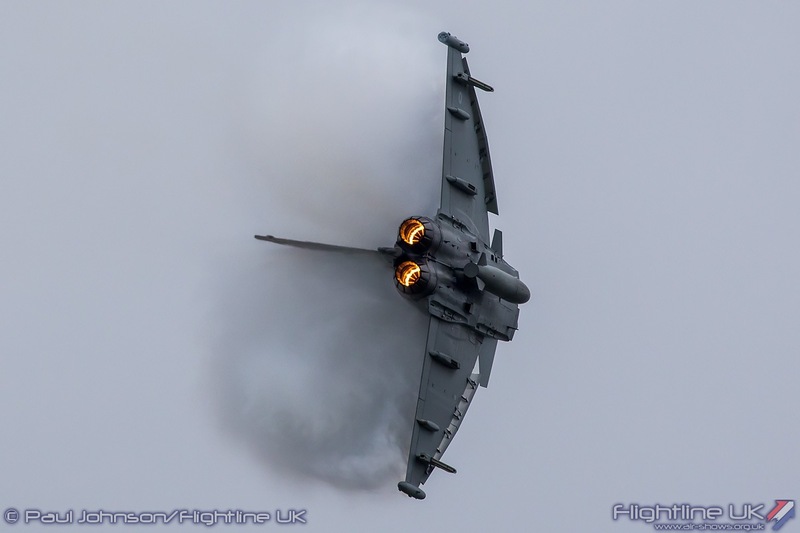 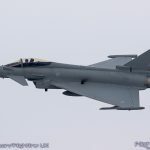 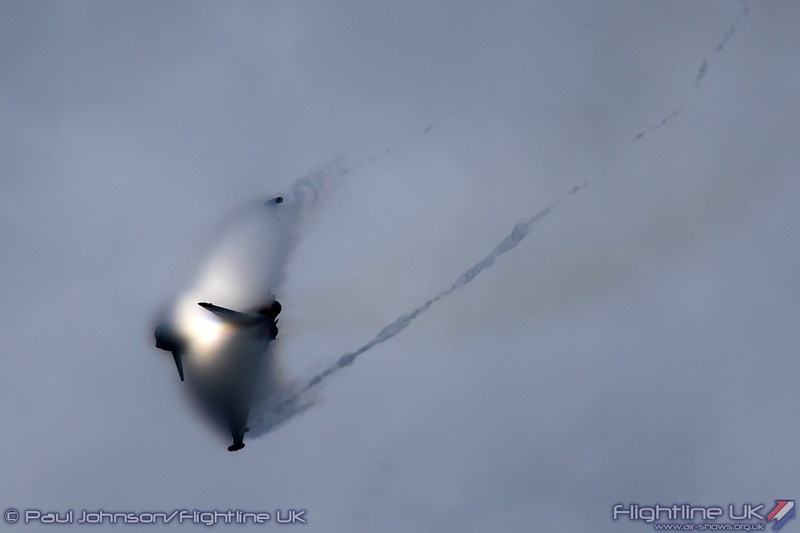 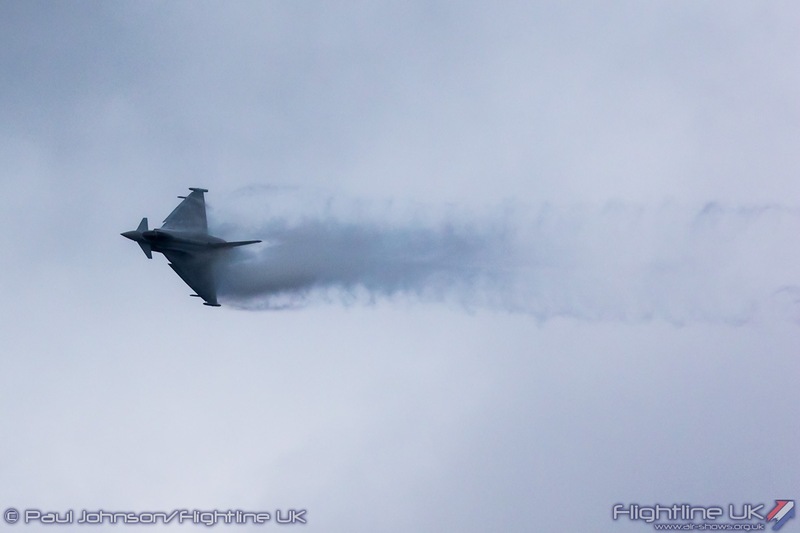 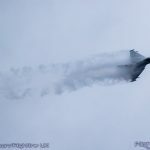 It did look as though Mark may have to bin his display with the low visibility and clouds sitting on the tops of the surround hills but a gap broke just as his display time arrived for a dramatic, vapour-filled display. 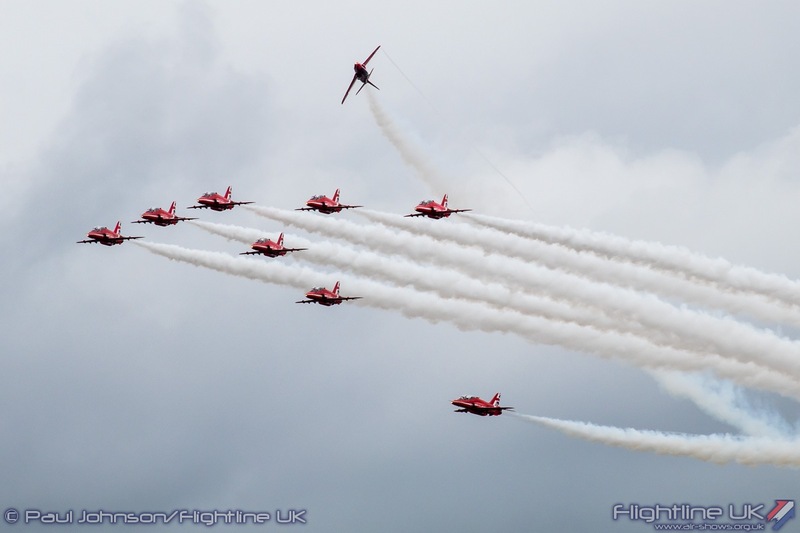 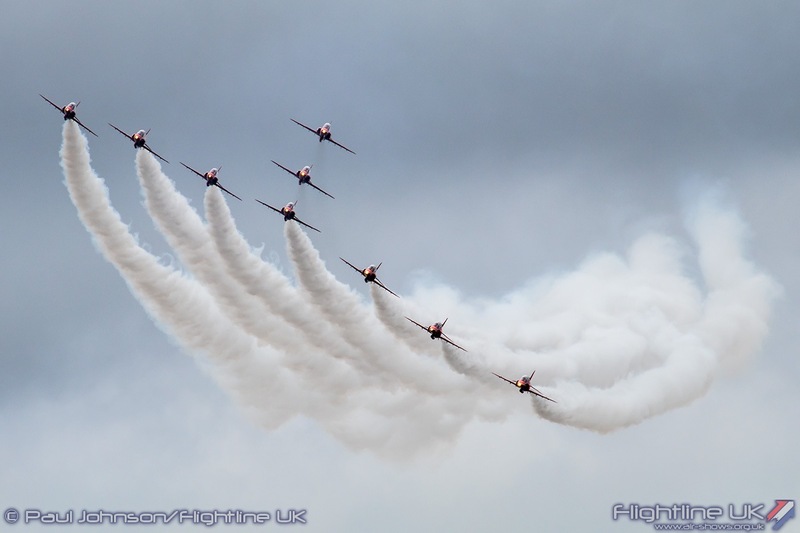 Weather too proved a problem for the Red Arrows, but this time on the Saturday. 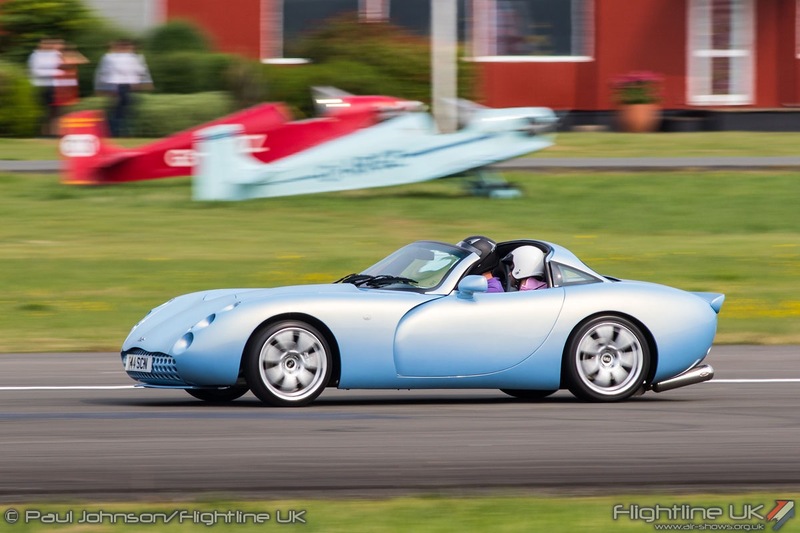 Dunsfold was bathed in very warm, sunny weather throughout the day. 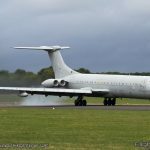 However, just north and west of the airfield, the UK was experiencing some very big thunderstorms bringing huge deluges of rain. 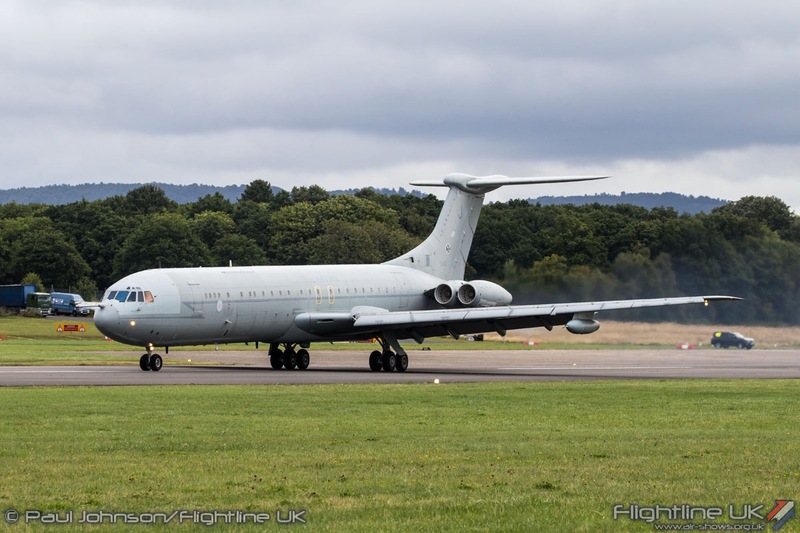 Sadly, one of these Thunderstorms sat right over the team’s weekend operating base of RAF Brize Norton at just the wrong time. 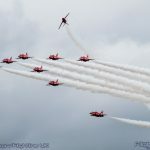 Its slow track would have meant the team would have had to depart and recover into the storm forcing Red 1 to scrub the display. 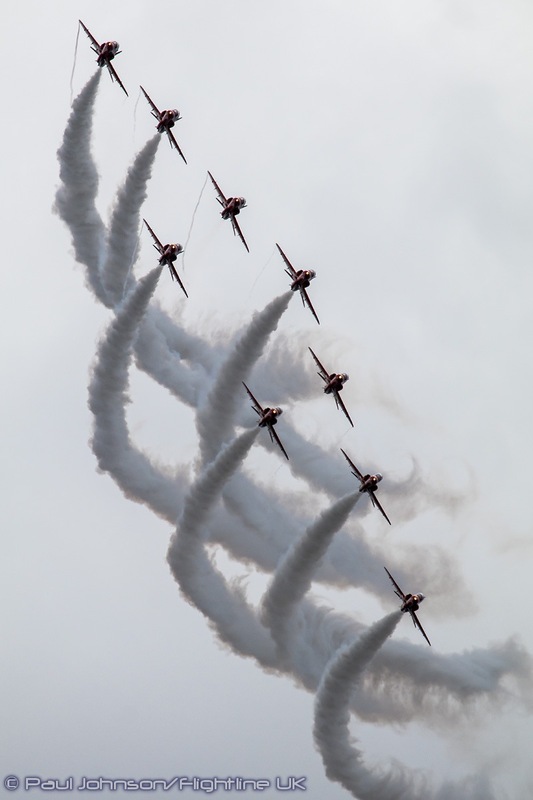 That left Sqn Ldr Mike Ling, Red 10, to explain to a disappointed crowd the Reds couldn’t finish the show. 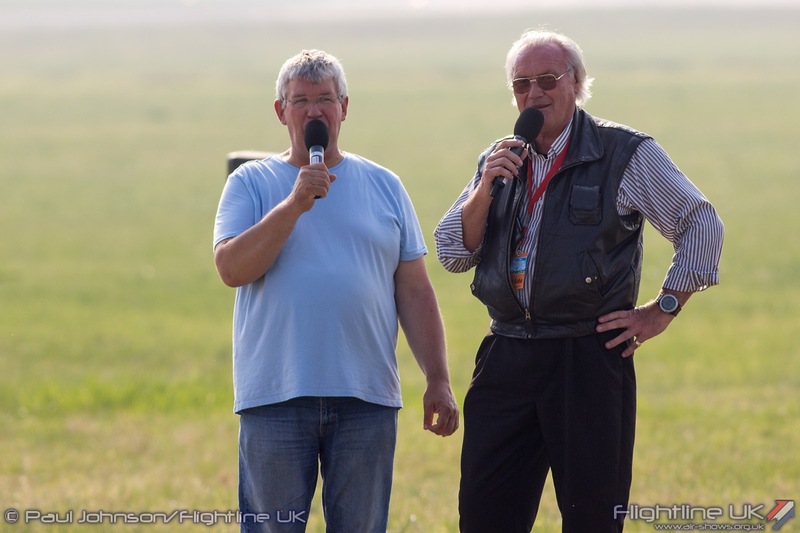 However he did not get away without providing a commentary. 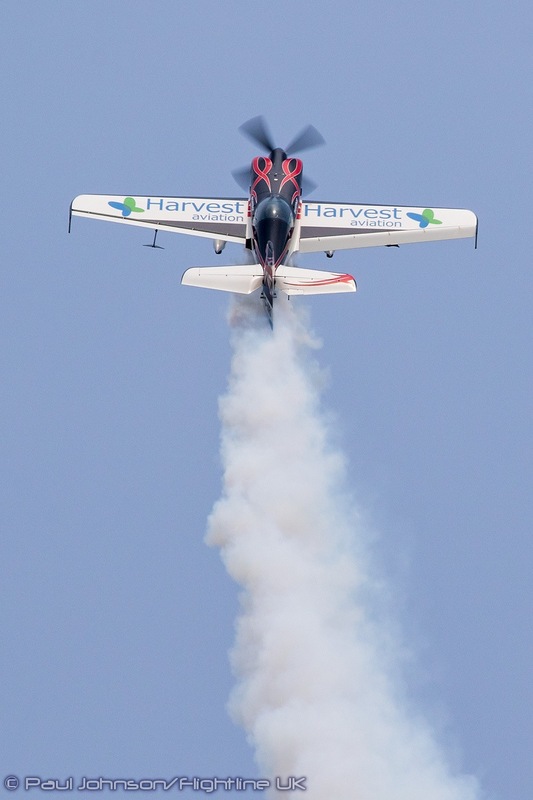 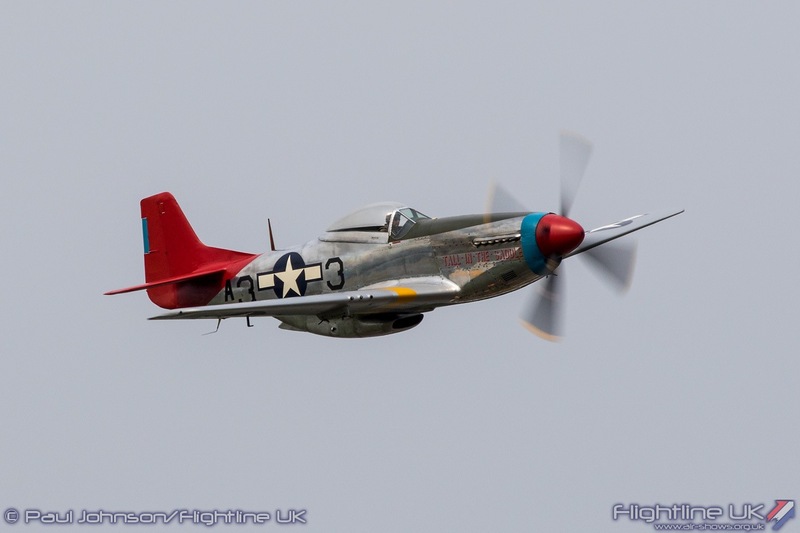 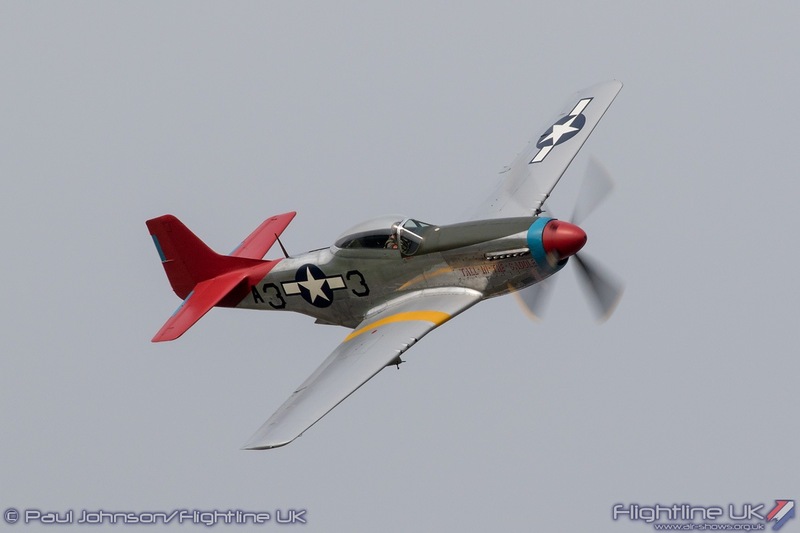 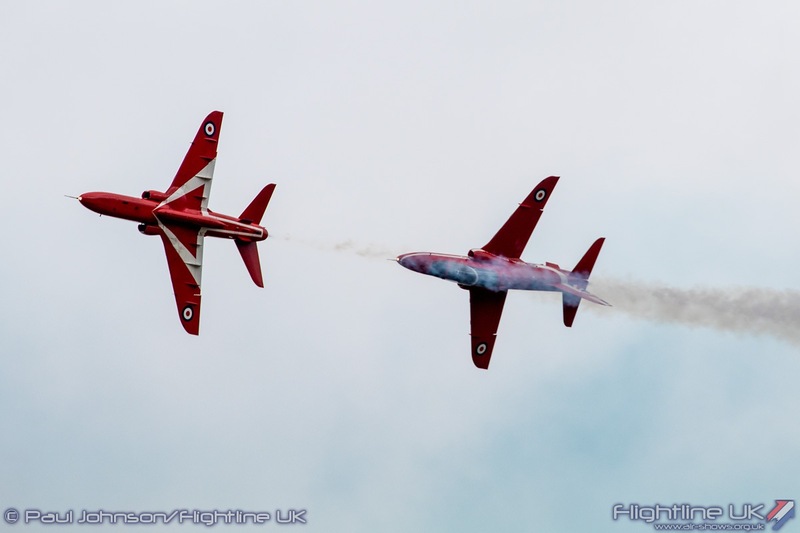 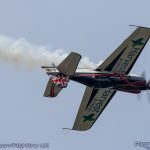 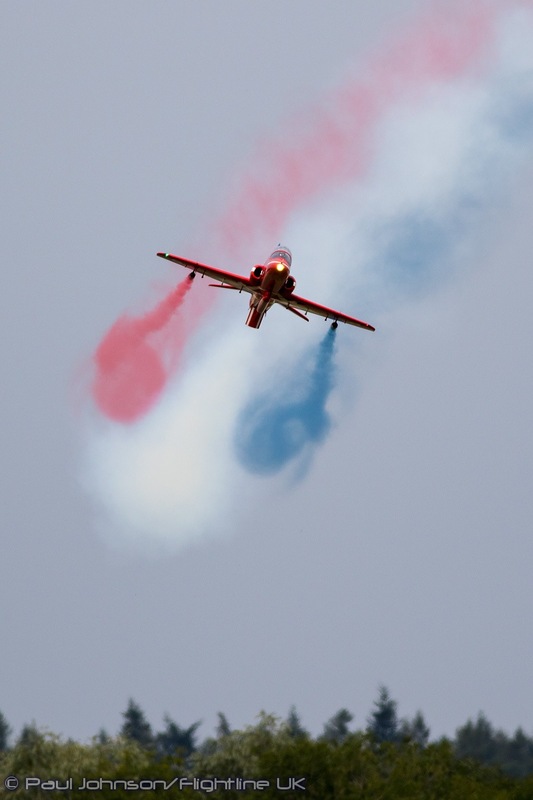 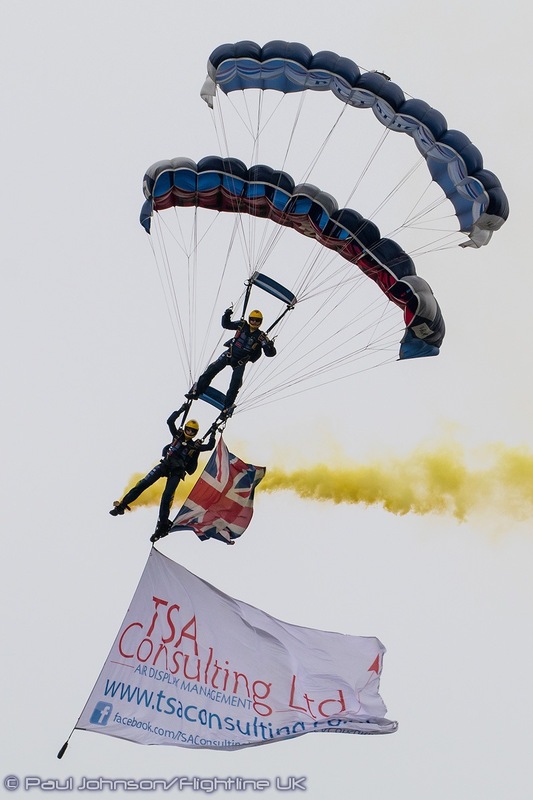 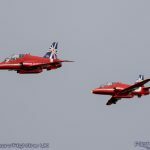 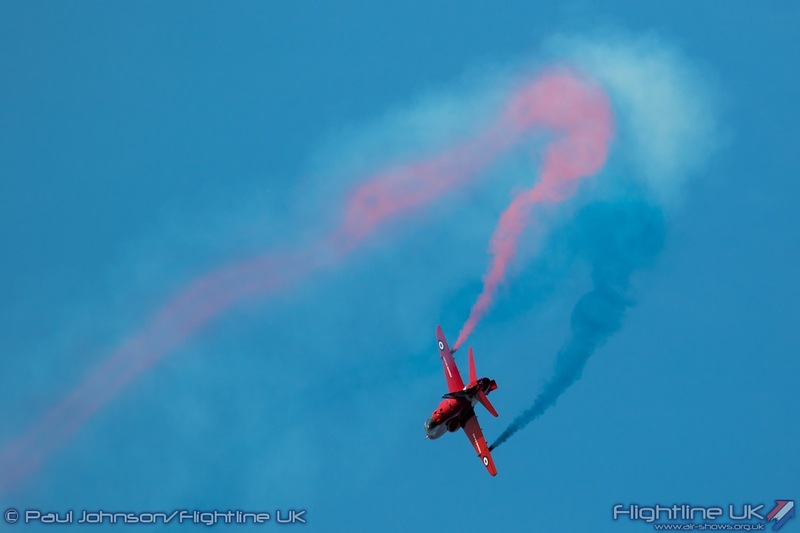 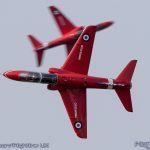 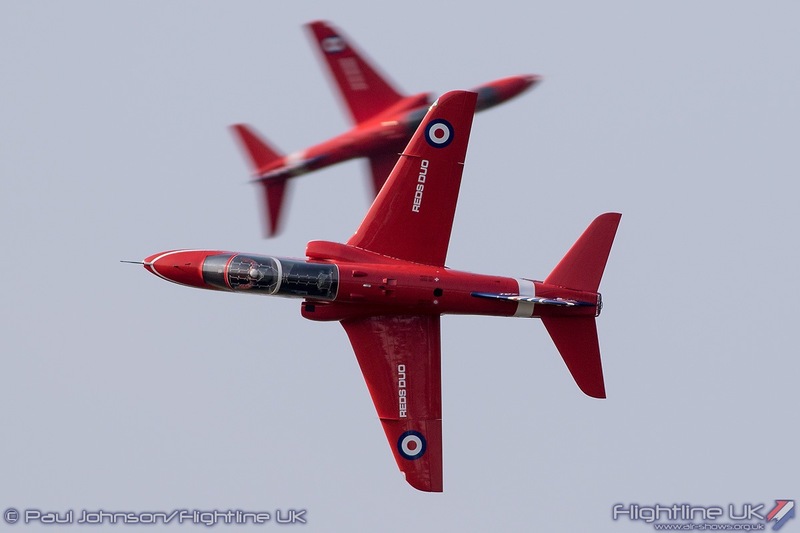 The Reds Duo has been a surprise highlight at Wings and Wheels at recent events. 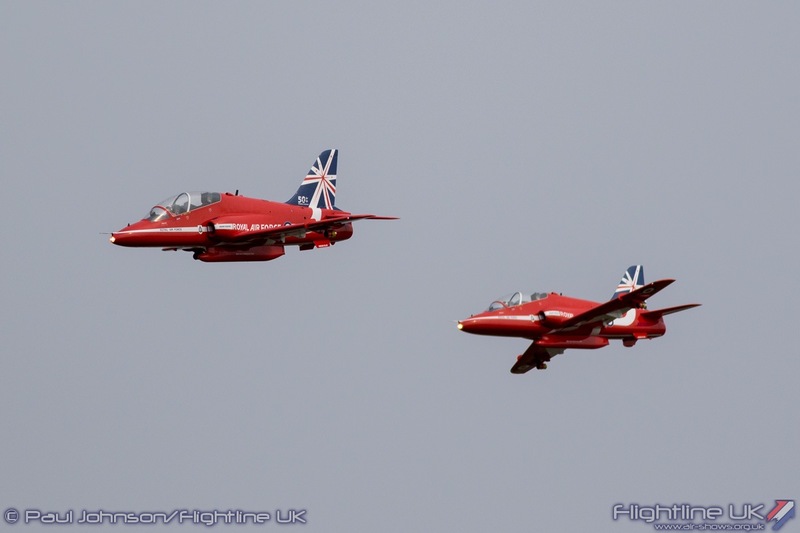 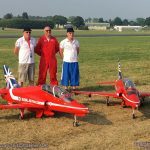 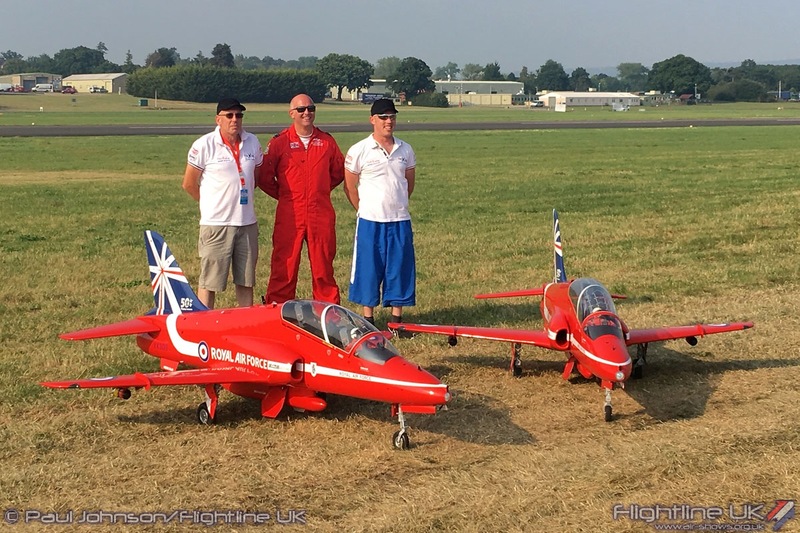 The Father and Son team of Steve and Matt Bishop fly two beautiful scale models of the Red Arrows Hawks. 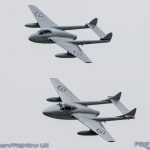 The models are powered by small jet engines and are also equipped with smoke, both from the engines and coloured smoke pods on the wings. 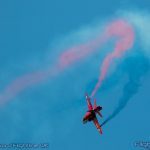 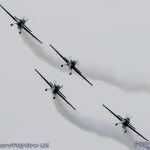 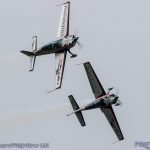 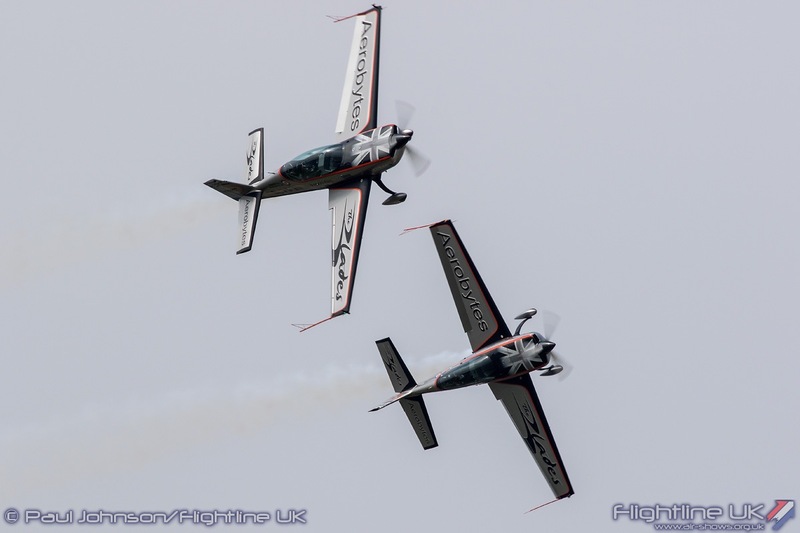 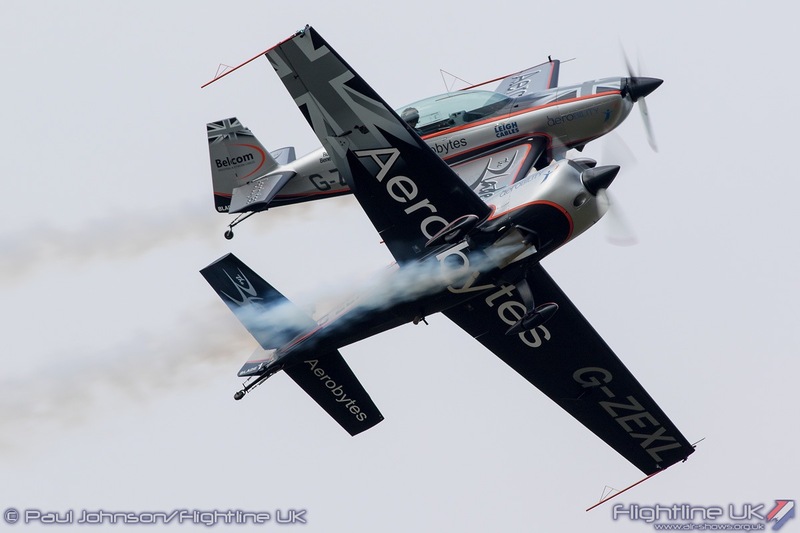 Steve and Matt fly a beautifully choreographed for formation and synchronised aerobatics with their models to music. 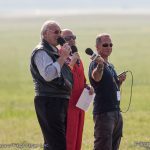 They closed the show on Saturday and Mike Ling was roped in by commentator Brendan O’Brien to talk the crowd through the Red Duo routine! 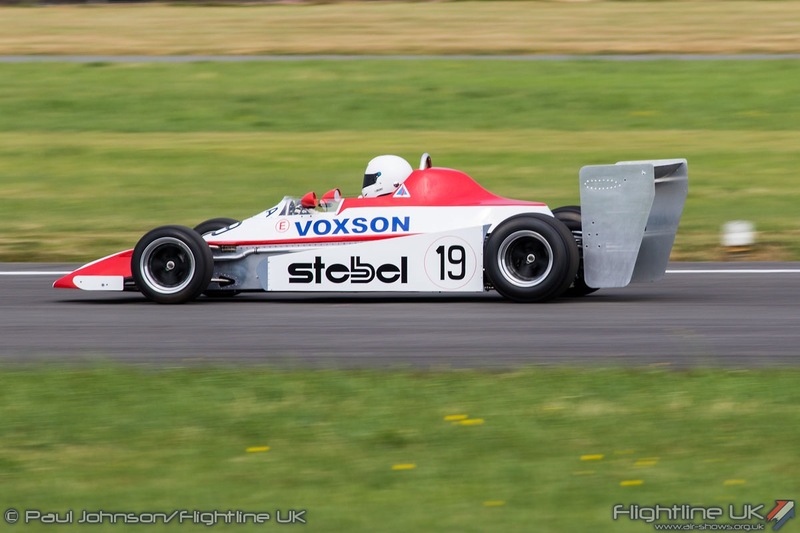 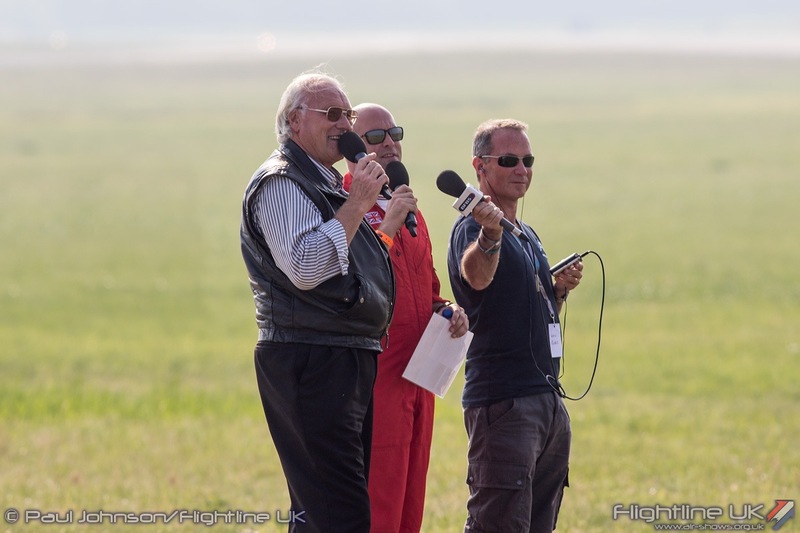 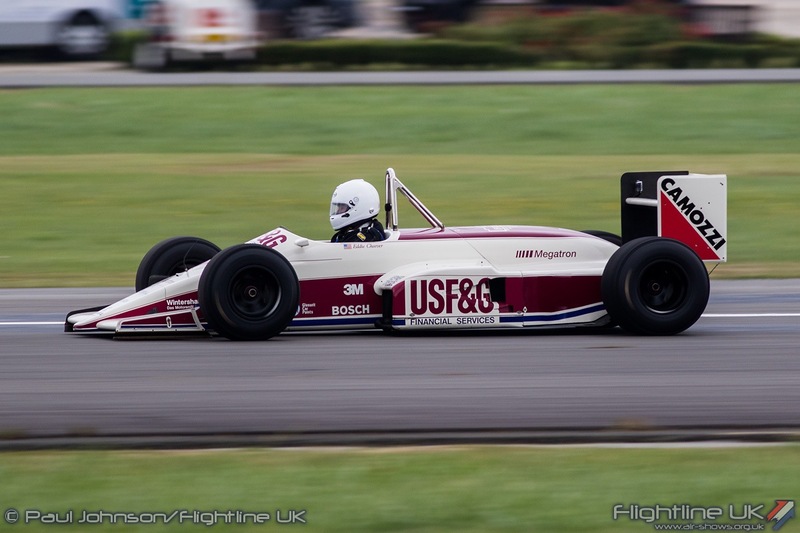 Mike was a great sport for joining in and it certainly helped sooth the blow of losing the full sized team for Saturday’s crowd – it was also one of those moments you could only imagine happening at Dunsfold! 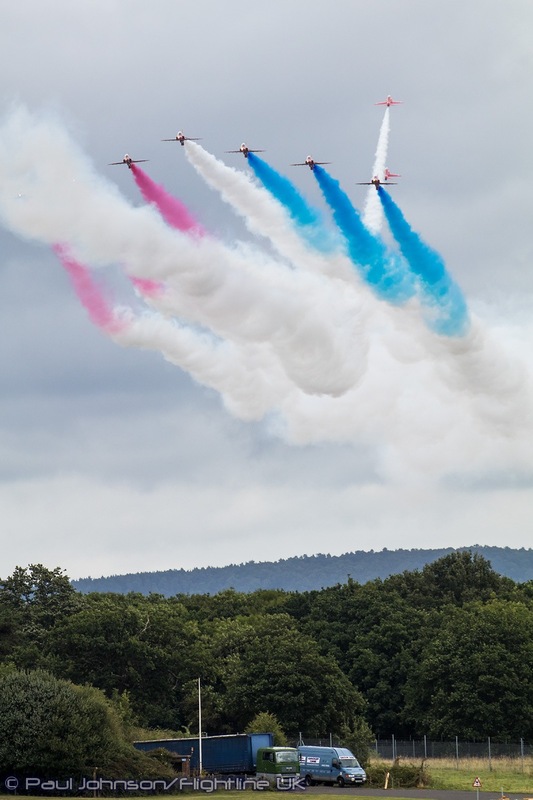 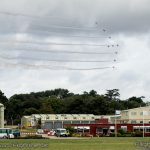 Despite cloudier skies, the Red Arrows did make it to Dunsfold on Sunday to open the main flying displays. 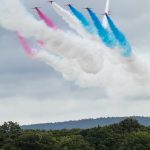 They flew their flat show which in the confines of Dunsfold’s restricted airspace and surrounding hills is always a dramatic display. 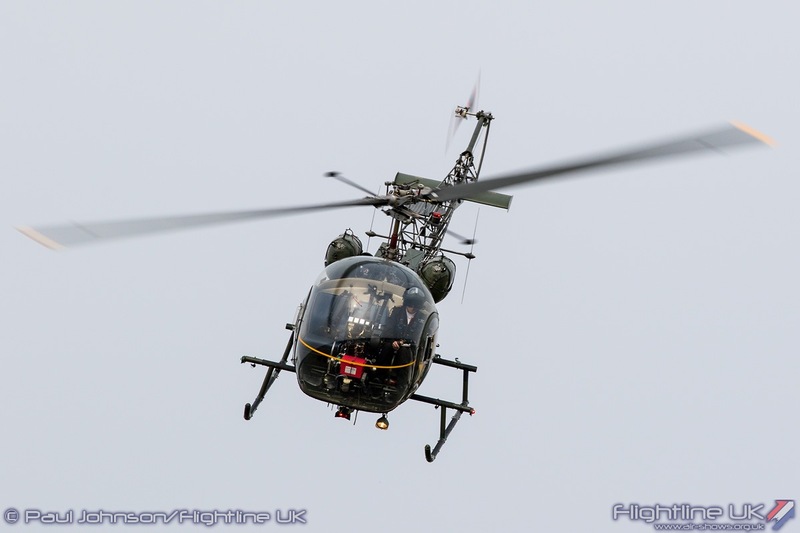 A surprise late addition to Saturday’s flying programme was a flypast by an Airbus Helicopters Puma HC2. 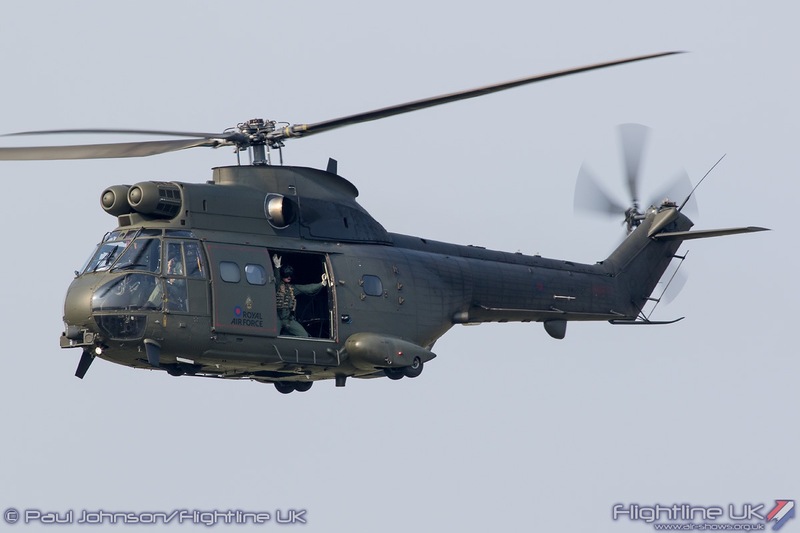 The crew from RAF Benson gave a single low flypast on their way back home. 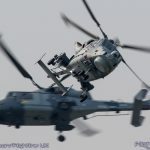 Pumas have been relatively rare on the display circuit, so this short glimpse was a very welcome addition to the show. 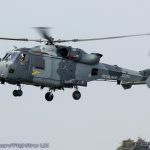 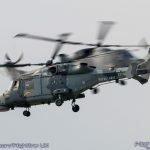 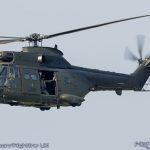 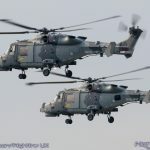 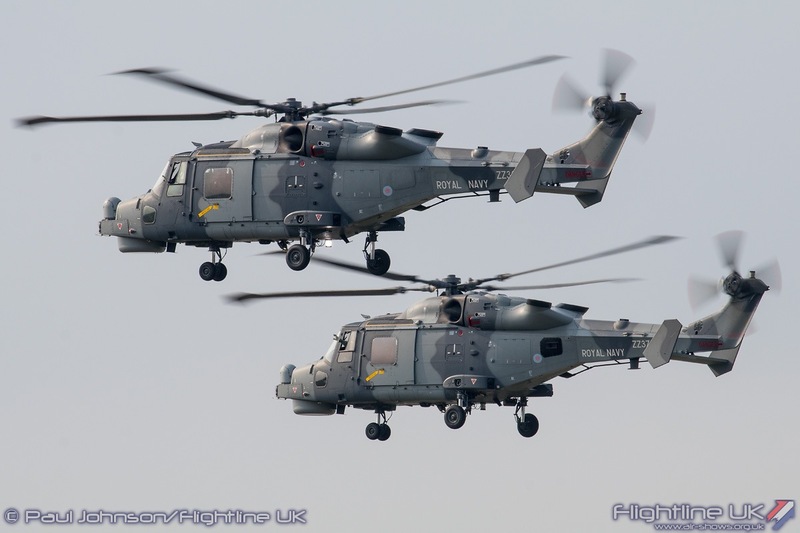 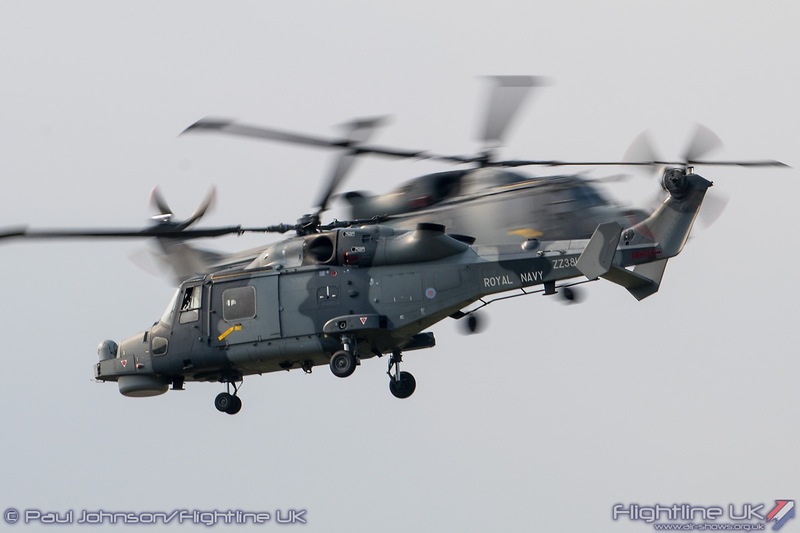 The Royal Navy Helicopter Display Team, the Black Cats, made a welcome return to Dunsfold. 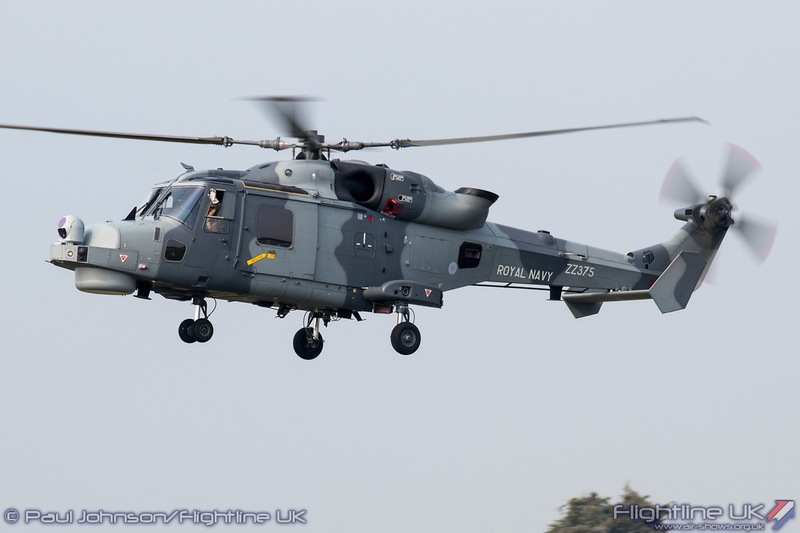 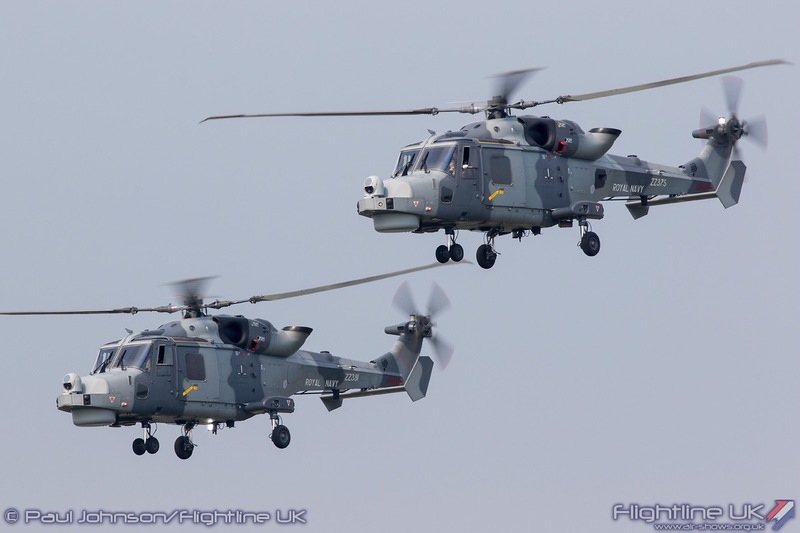 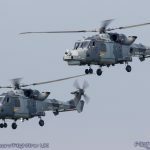 Since their last visit the team have transitioned to the AgustaWestland AW159 Wildcat HMA2. 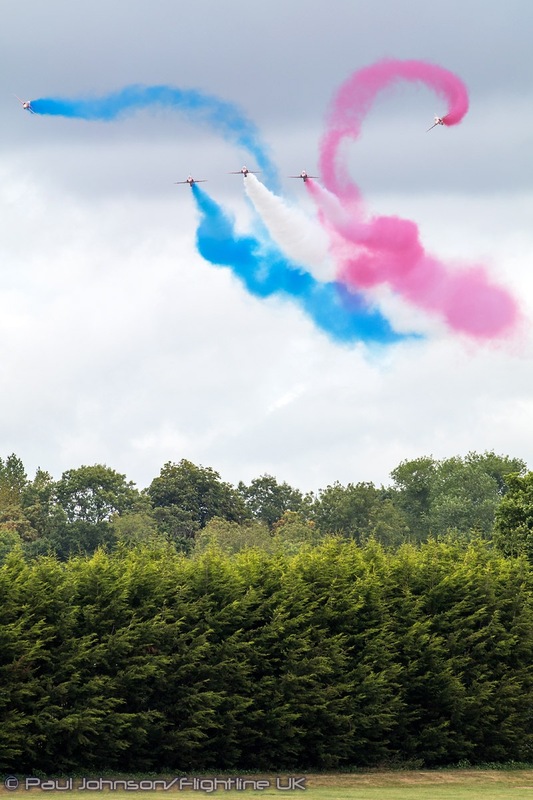 The team’s routine of close formation flying and opposition passes is always an impressive addition to any flying programme and their display was particularly well received by the Dunsfold audience. 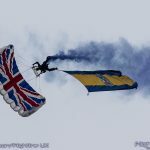 The Princess of Wales Royal Regiment has supported Wings and Wheels since it began in 2004 with the Tigers Freefall Parachute Display Team. 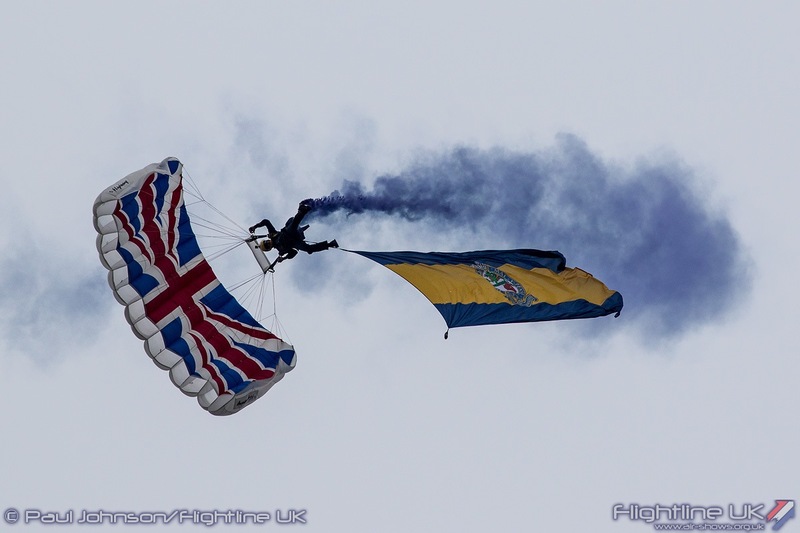 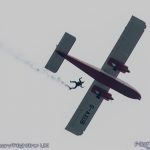 They are a very popular parachute team always presenting something different for the crowd. 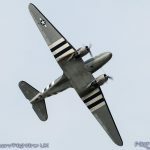 For Dunsfold, this was live commentary from team leader Corporal Frank Millerick from the aircraft and as he descended into the drop-zone. 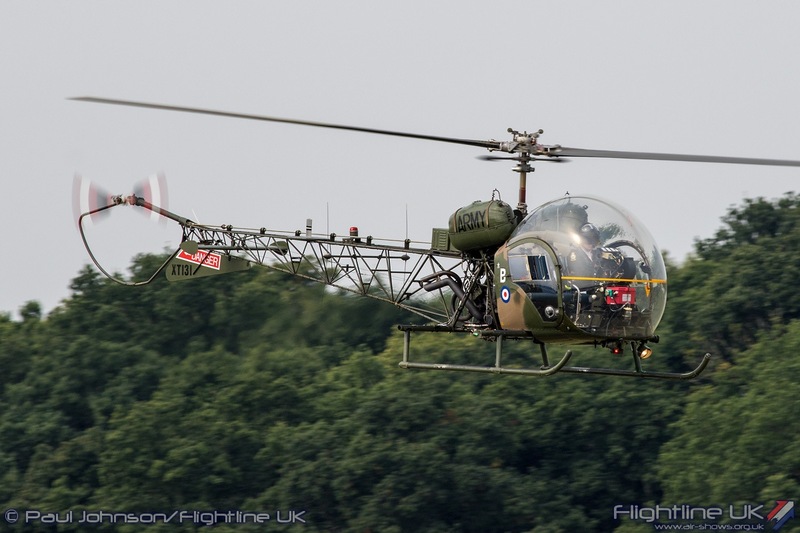 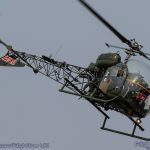 It has been great to see the Army Air Corps Historic Aircraft Flight back on the display circuit this year and making their first appearance at Dunsfold. 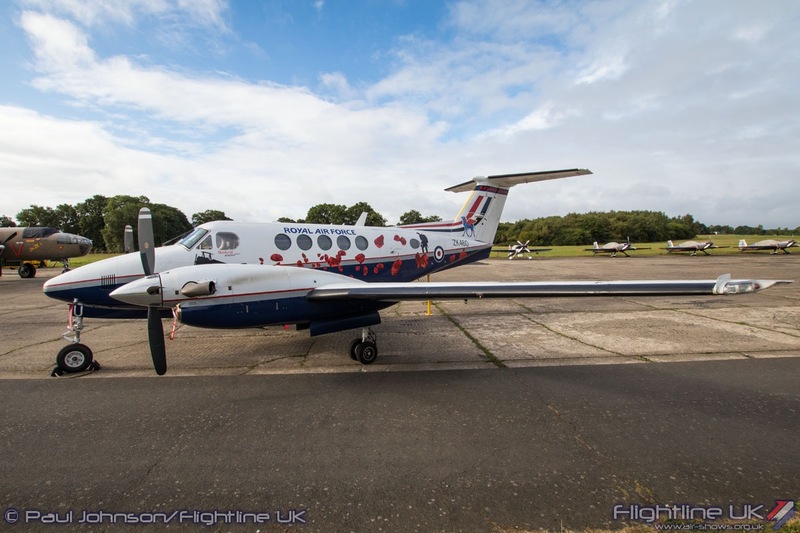 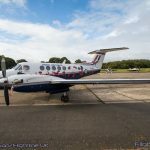 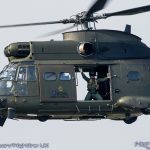 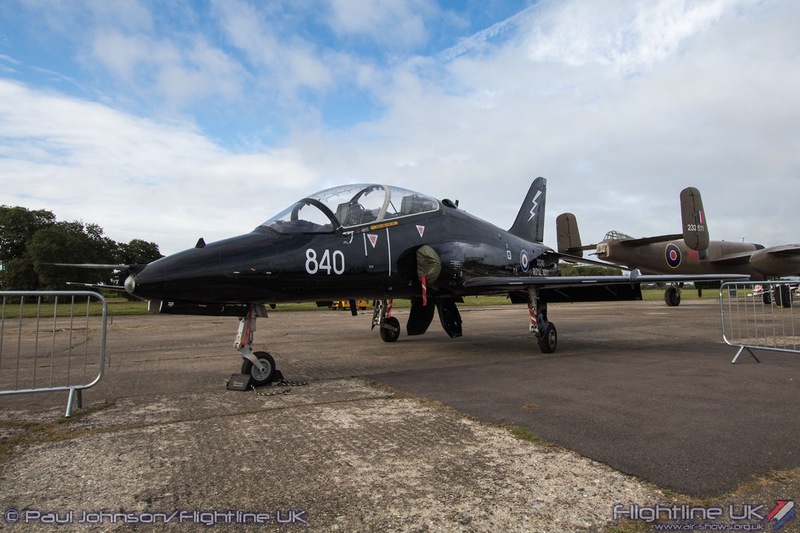 The Flight is now a charitable trust with its aircraft on the civilian register which avoids the aircraft having to comply with Military certification requirements. 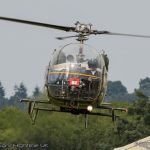 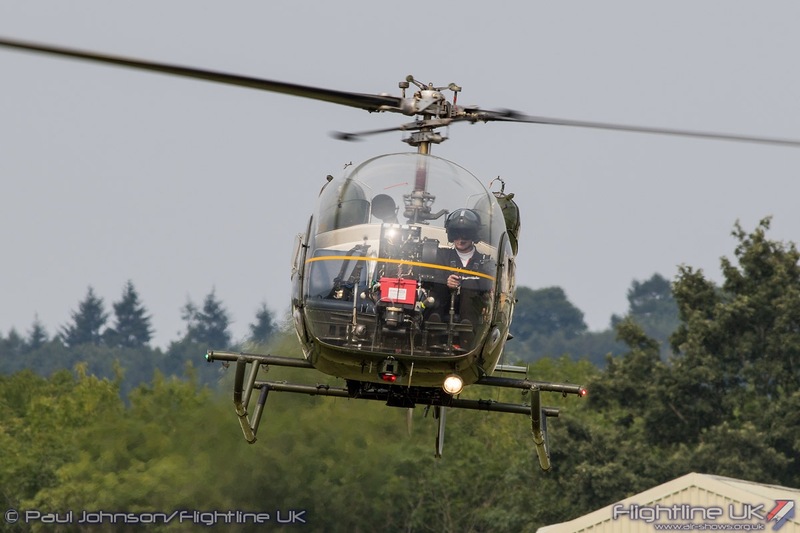 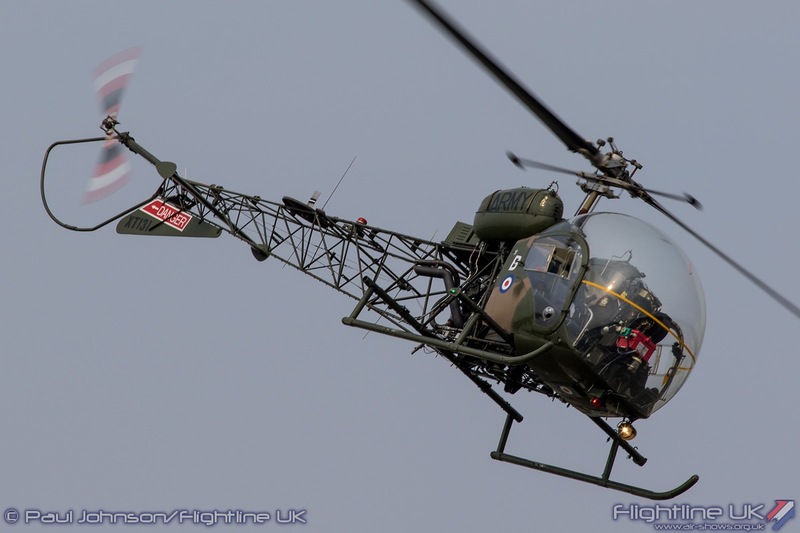 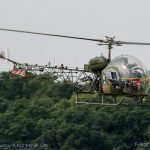 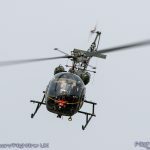 Sadly, the Westland Scout was unavailable but the lovely Agusta/Bell Sioux AH1 put in a solo display each day showing off some early rotary technology. 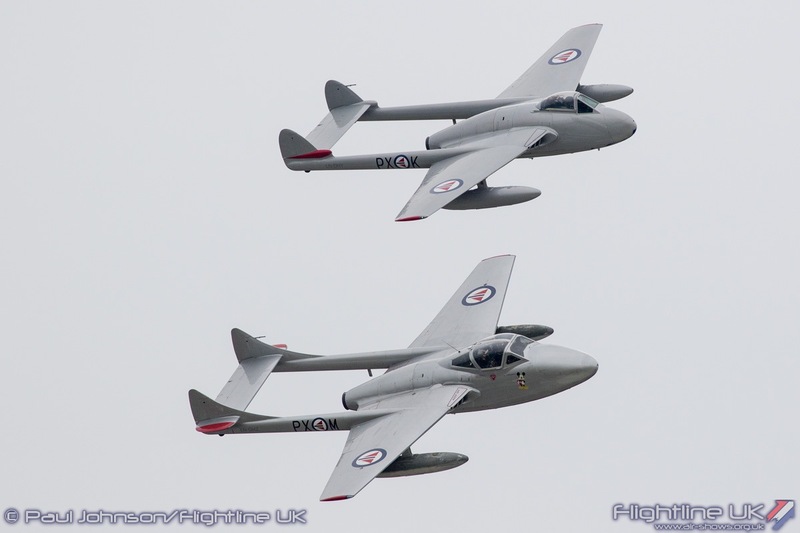 The Dunsfold flying display also saw a couple of other displays remembering the Cold War period. 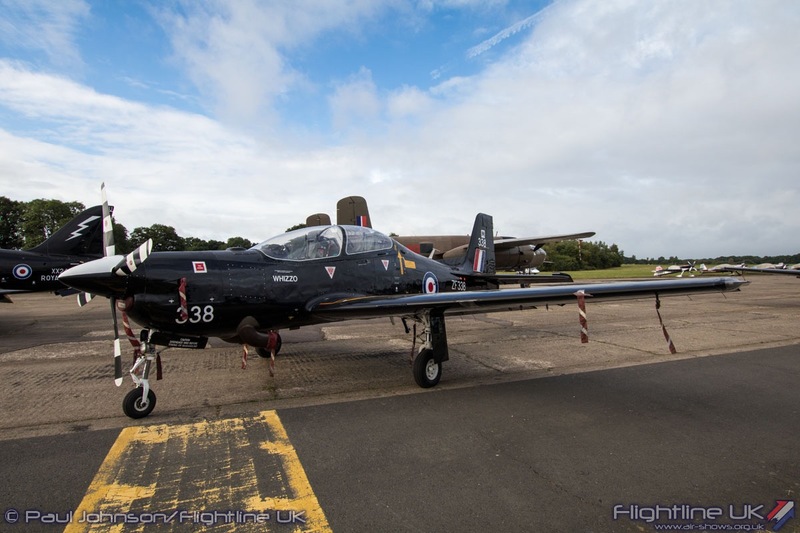 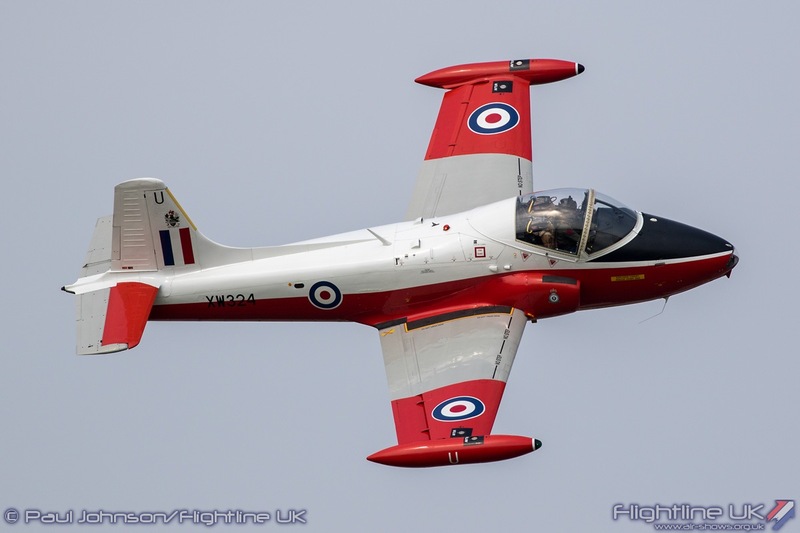 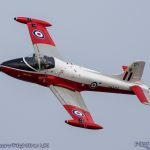 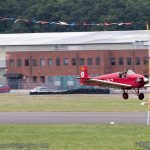 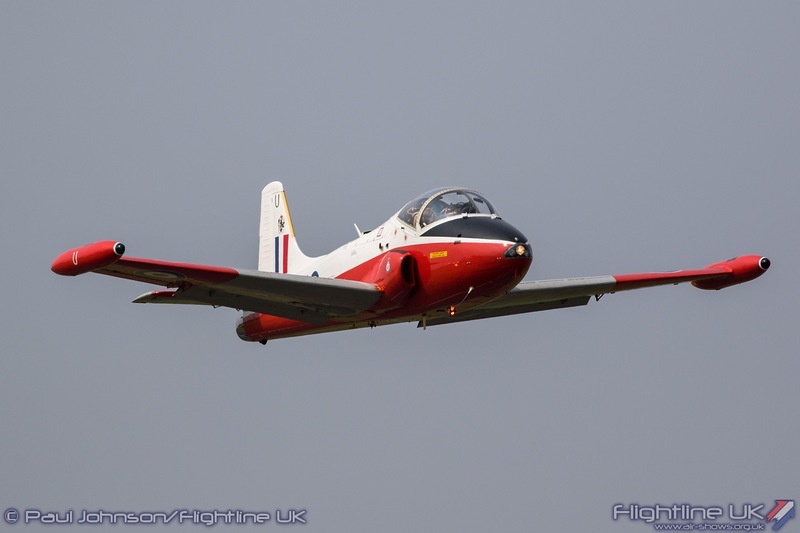 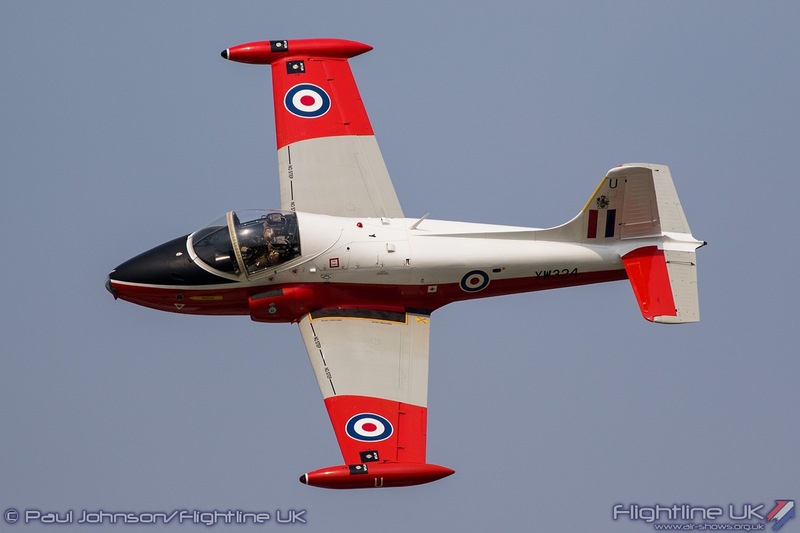 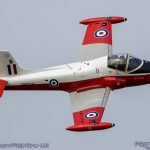 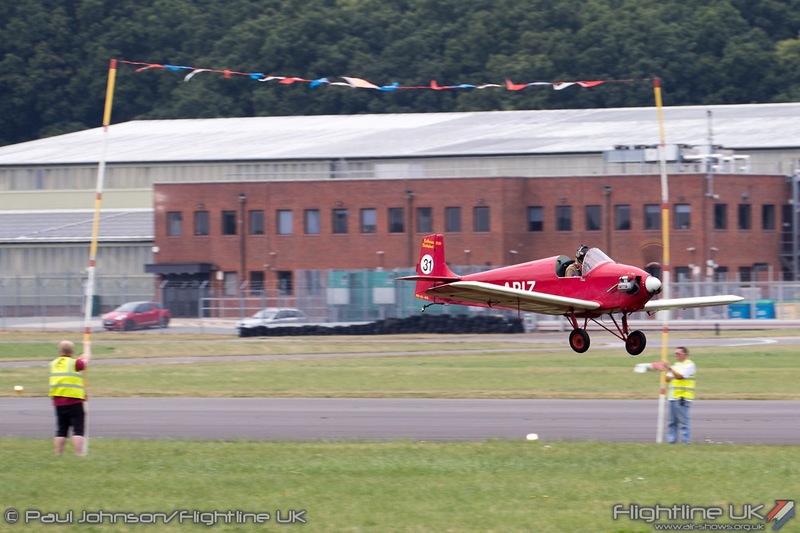 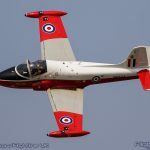 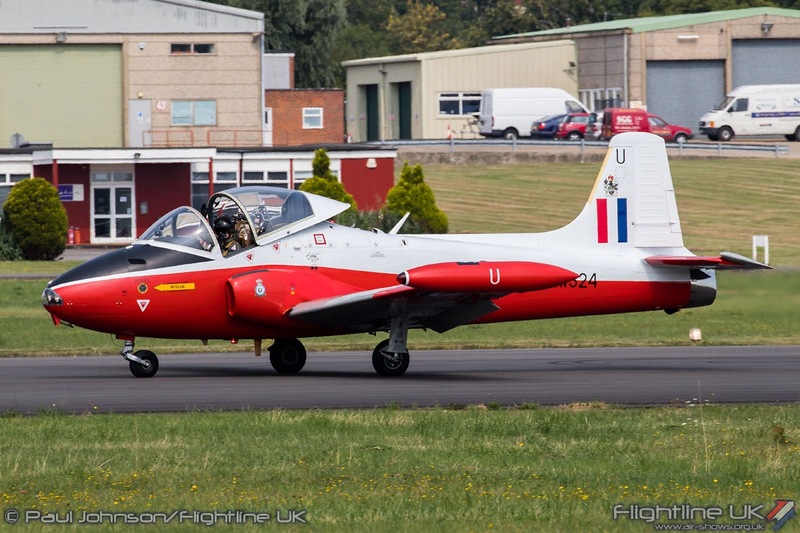 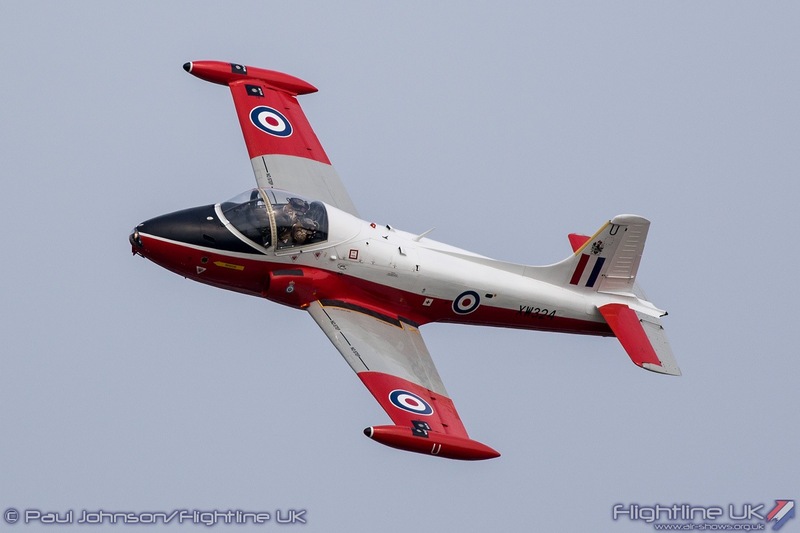 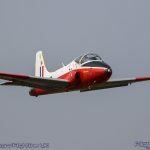 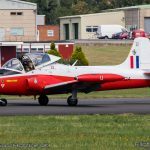 Jeff Bell’s BAC Jet Provost T5 has become a Dunsfold regular in the hands of Dan Arlett and made a welcome return flying a non-aerobatic solo display. 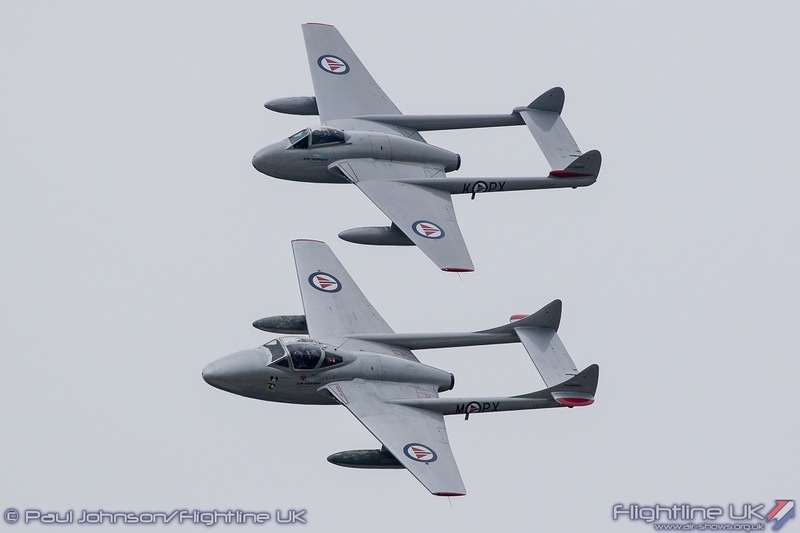 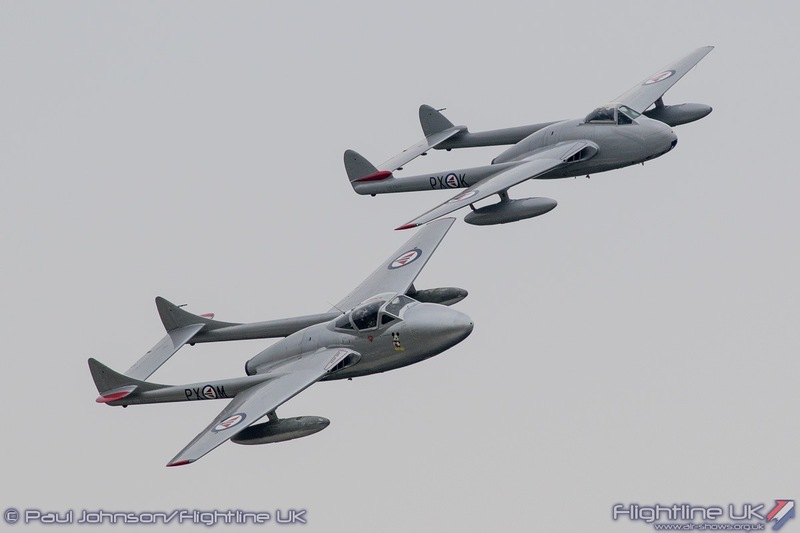 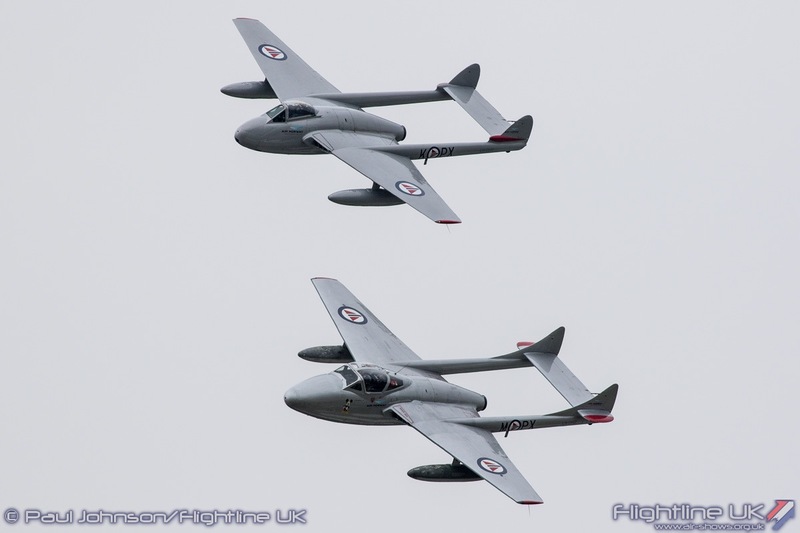 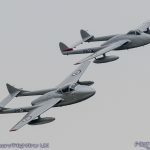 Joining the ‘JP’ was the Norwegian Air Force Historical Squadron’s de Havilland Vampire FB52 and Vampire T55. 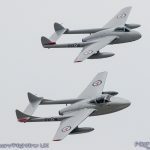 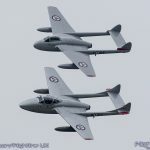 The Vampires put on a particularly beautiful display of sweeping passes in close formation showing both the underside and top surfaces of the early jets. 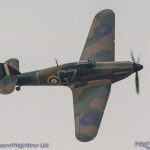 However, it was aircraft Second World War that provided much of the historic action. 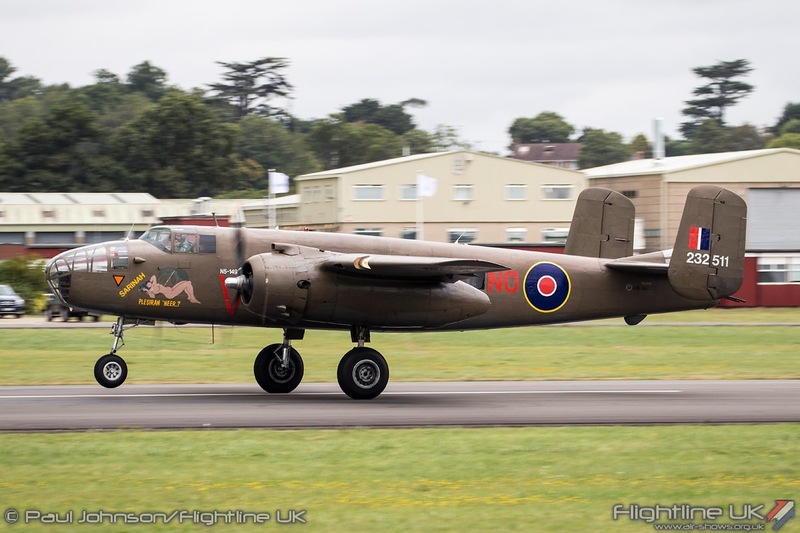 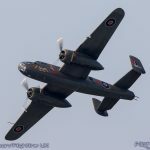 The Dunsfold air display always reflects on the history of Dunsfold aerodrome and has regularly featured the Royal Netherlands Air Force Historic Flight’s North American TB-25N Mitchell as the type was based at Dunsfold between 1942 and 1944. 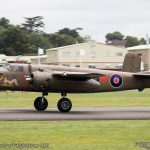 One of the Mitchell squadrons to be based at Dunsfold was No 320 (Netherlands) Squadron when it formed part of the 2nd Tactical Air Force. 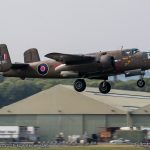 This year’s Wings and Wheels hosted a reunion of 320 Squadron veterans and families during the weekend with the Mitchell taking pride of place. 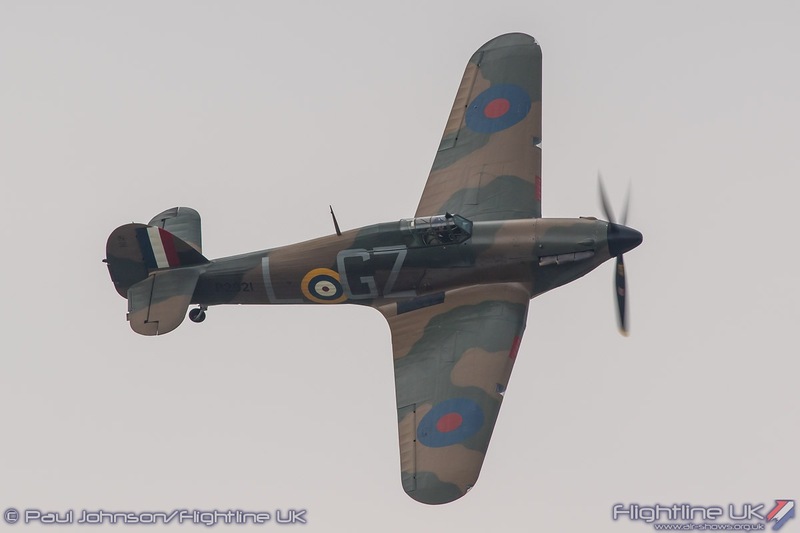 Specifically for the re-union the Royal Netherlands Air Force applied RAF roundels and 320 Squadron codes to their Mitchell for the occasion. 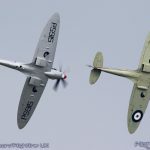 The Royal Air Force Battle of Britain Memorial Flight pilots, Squadron Leader Andy Millikin and Flight Lieutenant Antony Parkinson also visited the 320 Squadron reunion during the show and dedicated their display in the Supermarine Spitfire IIa and Spitfire PRXIX to the 320 Squadron veterans. 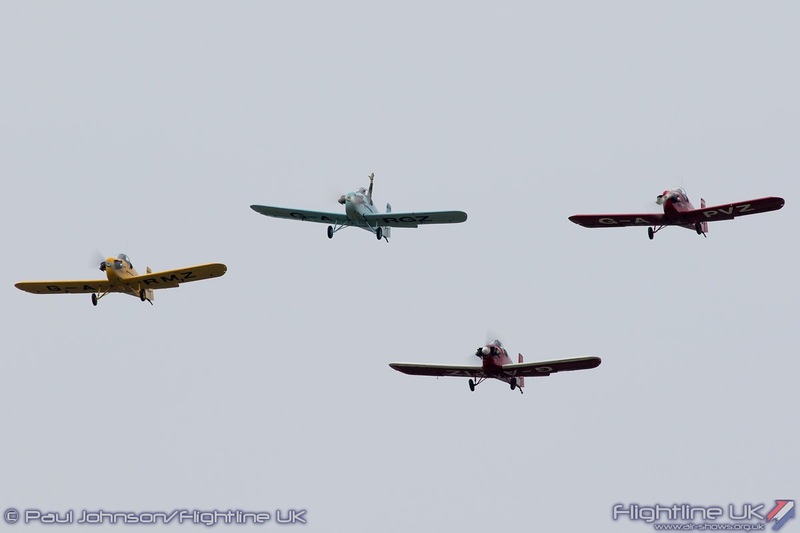 No Dunsfold Wings and Wheels flying display would be complete without at least one special formation. 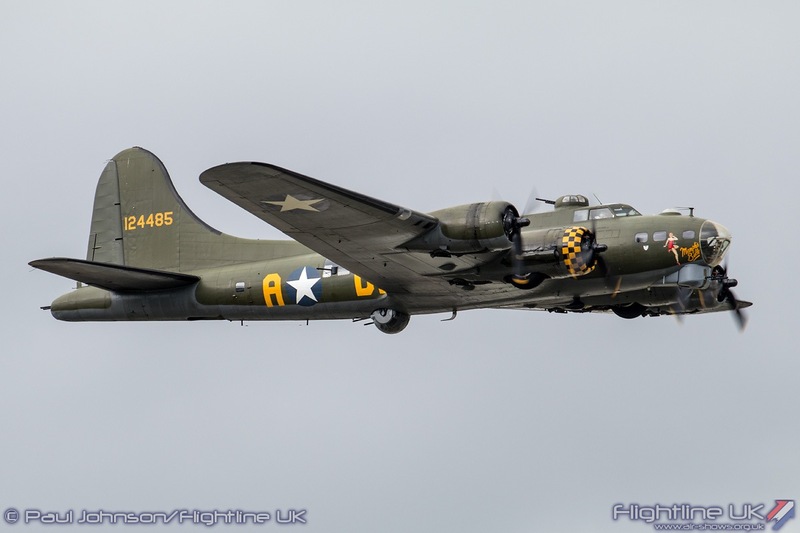 Saturday’s display saw the Mitchell join up with the Boeing B-17G Flying Fortress Sally-B for a formation flypast in between their solo displays. 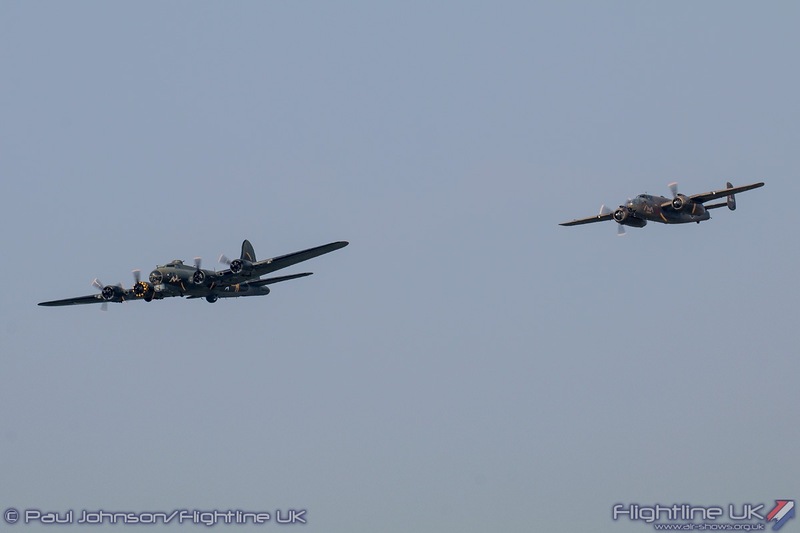 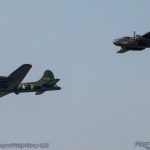 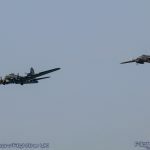 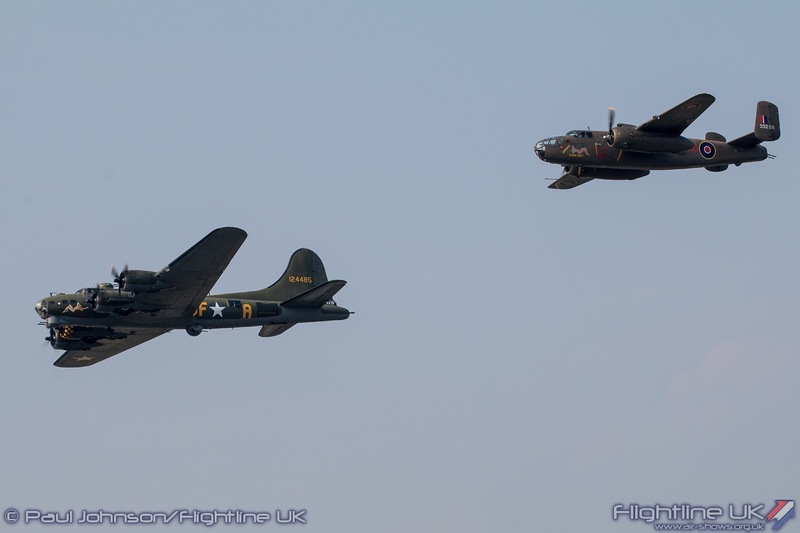 It was great to see the two bombers together in a pass reminiscent of the Great Warbirds Air Displays at which Sally-B always took a leading role. 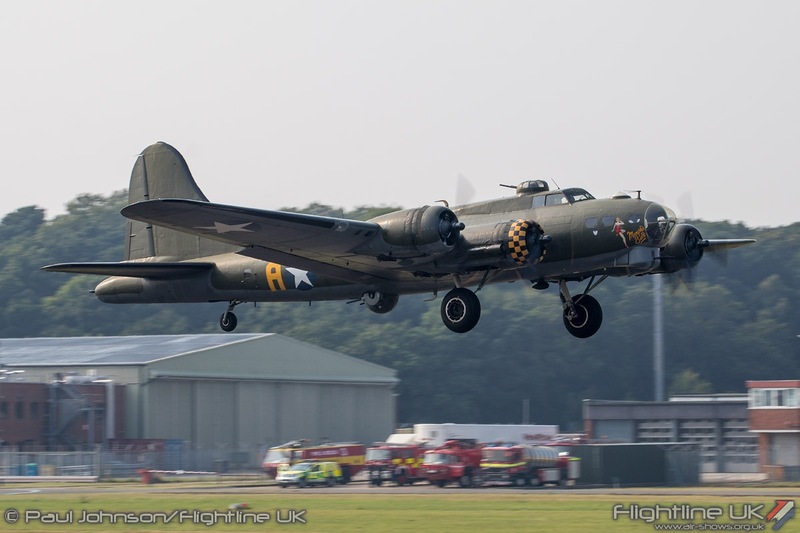 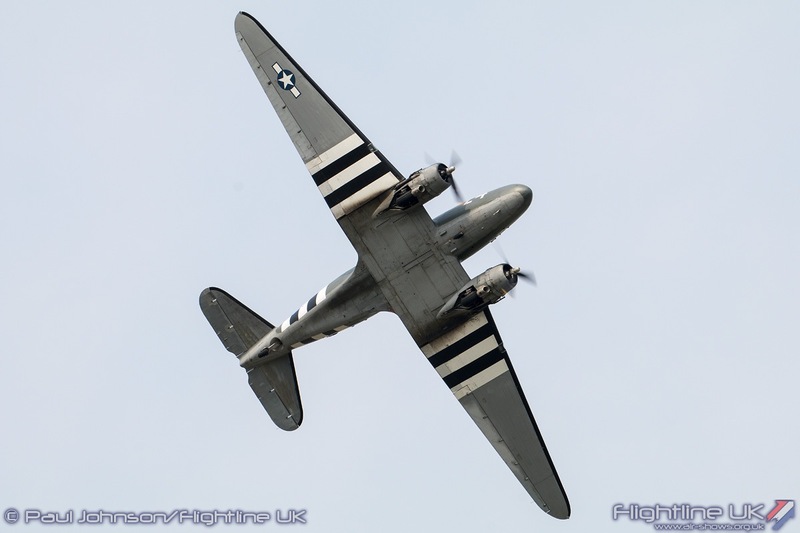 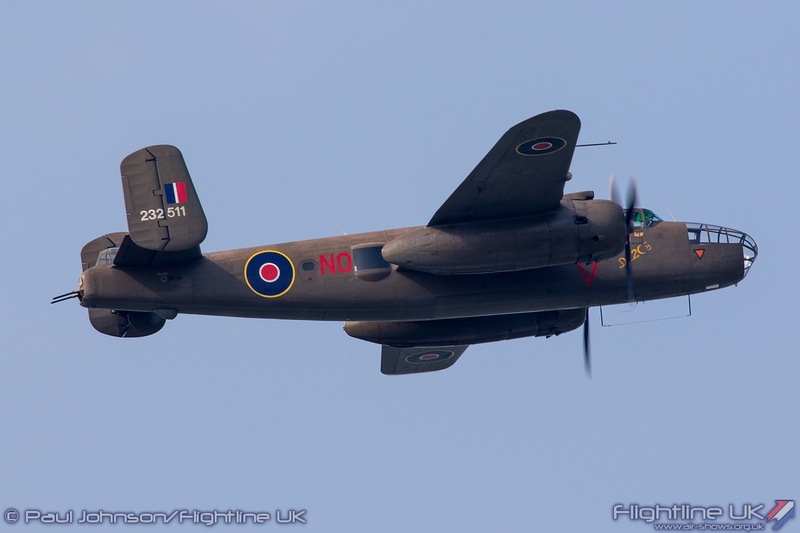 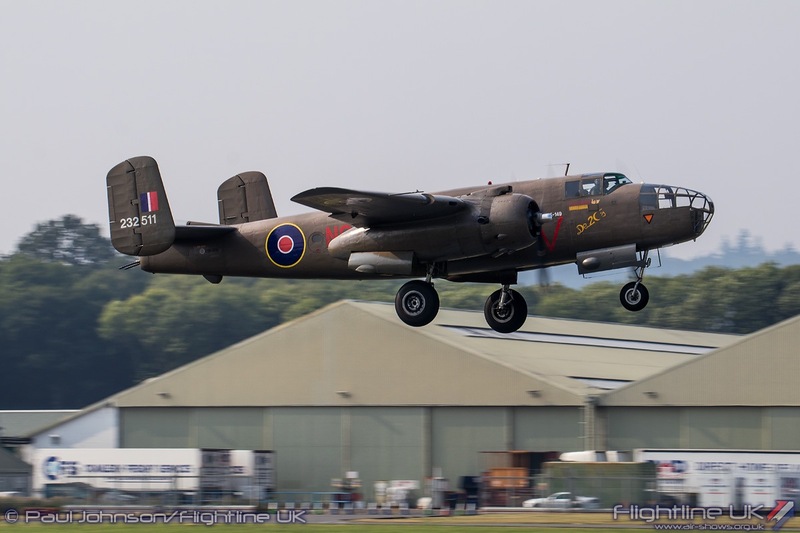 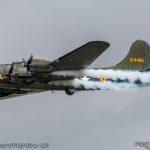 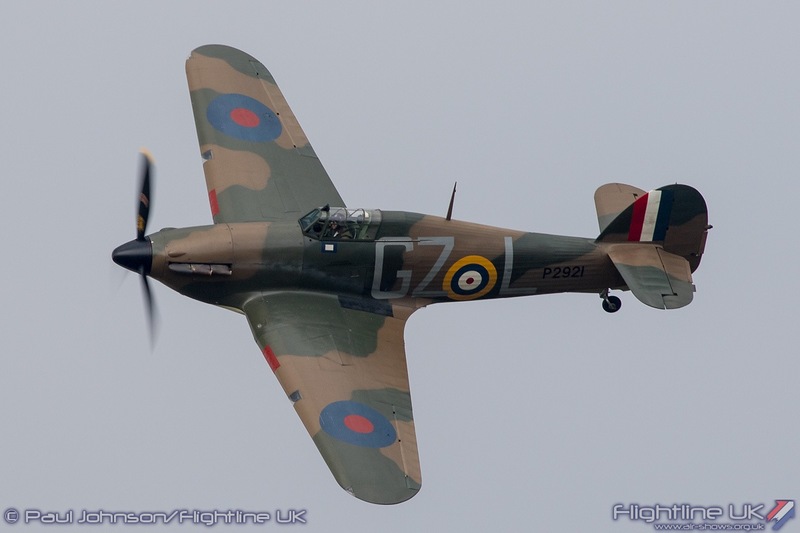 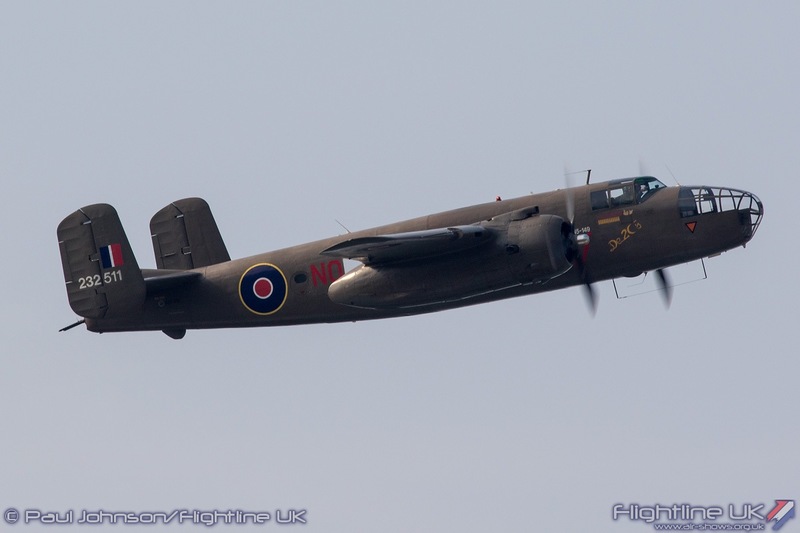 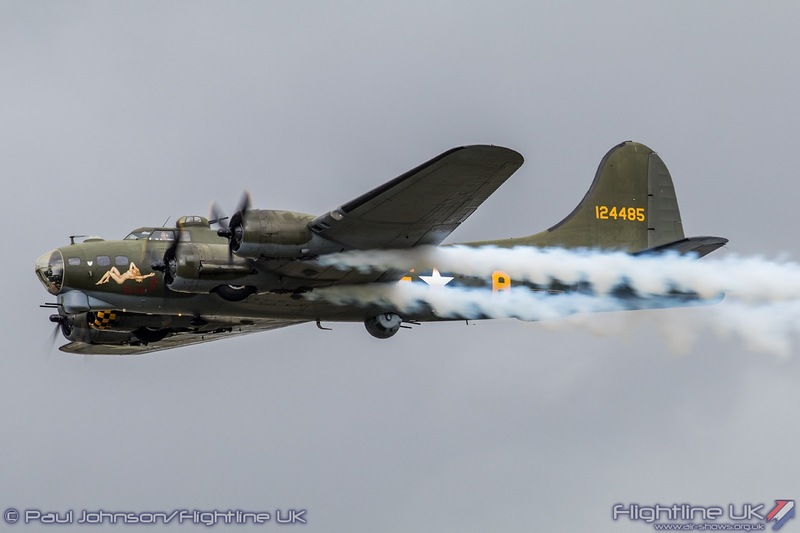 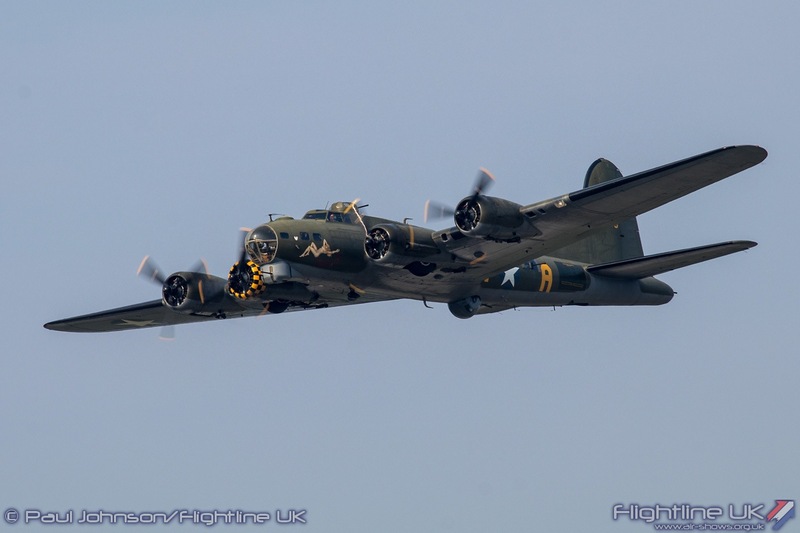 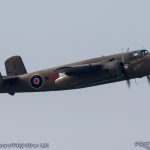 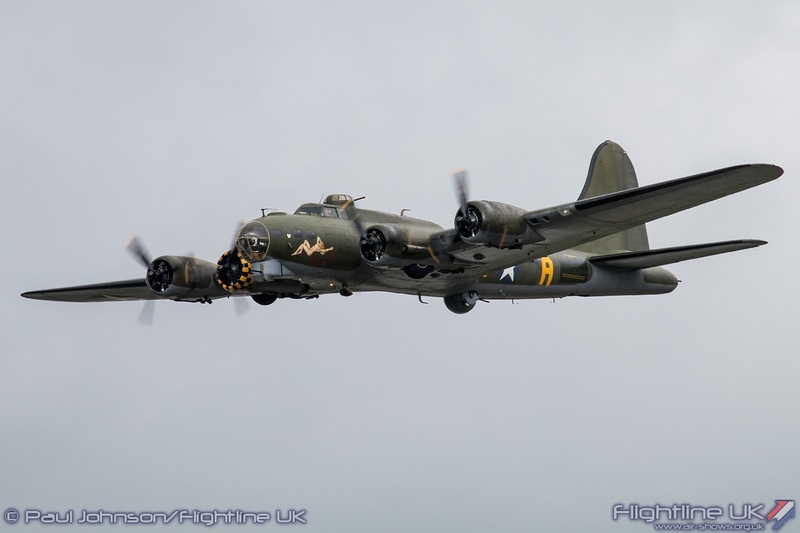 Sally-B was making a welcome return to Wings and Wheels having first appeared at the event last year. 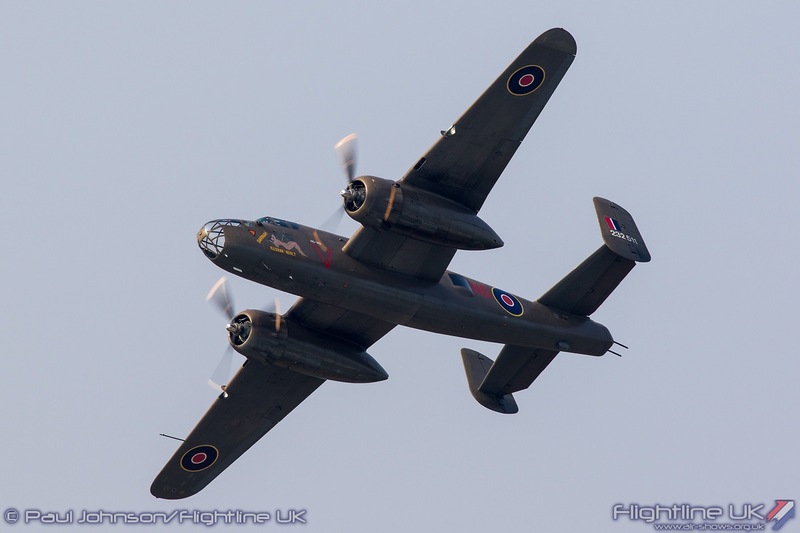 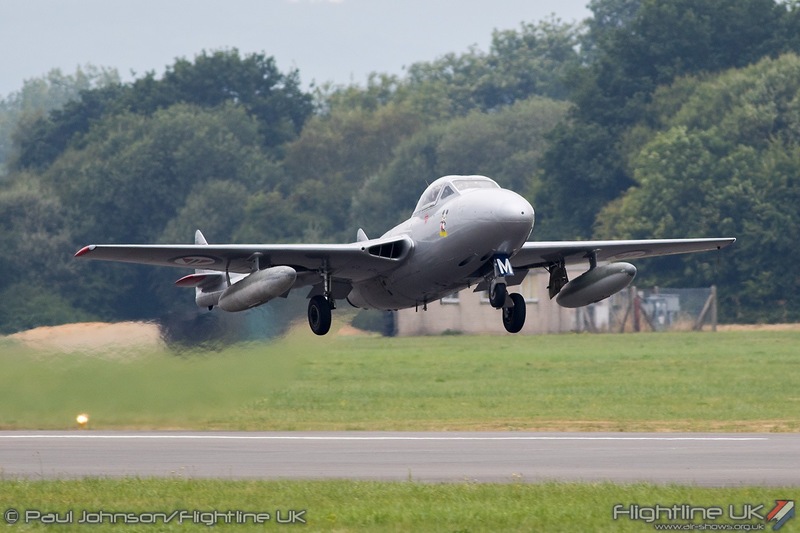 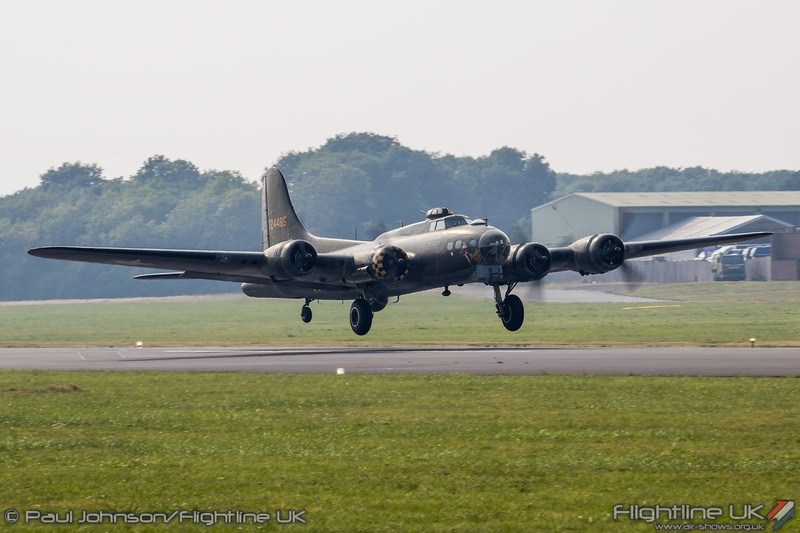 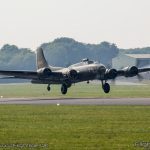 This year however, she was operated from Dunsfold allow the crowd to see her up close on take-off and landing. 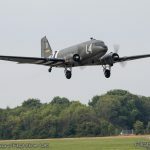 Another big warbird display marking Dunsfold heritage and its modern day role as a film set was Aces High Douglas C-47A Skytrain. 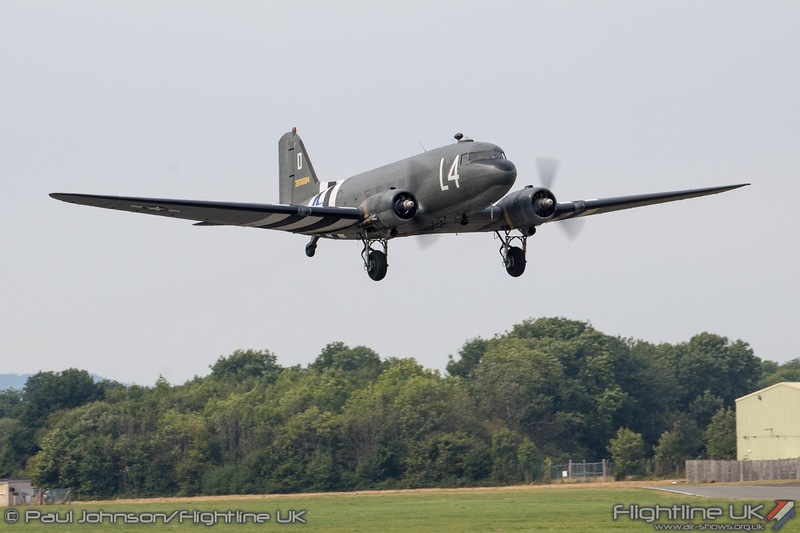 Dunsfold played an important role in the Berlin Airlift when it was a base for Skyways Limited. 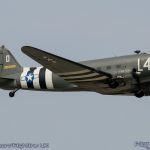 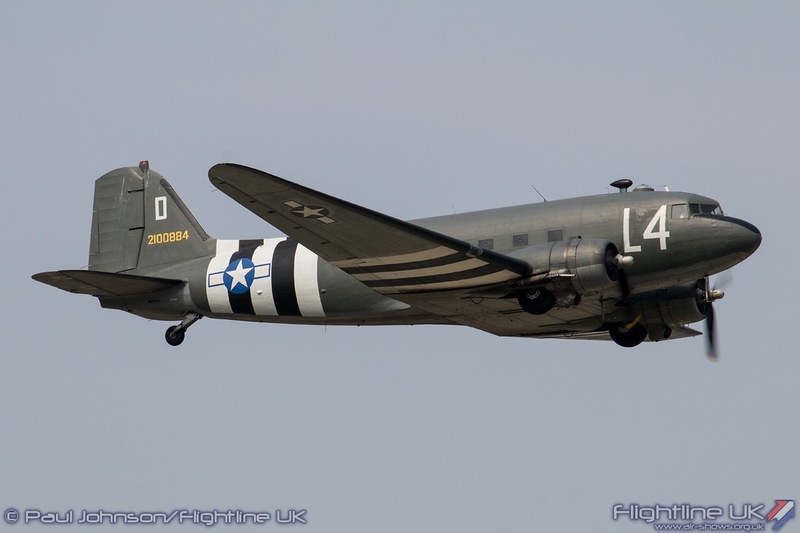 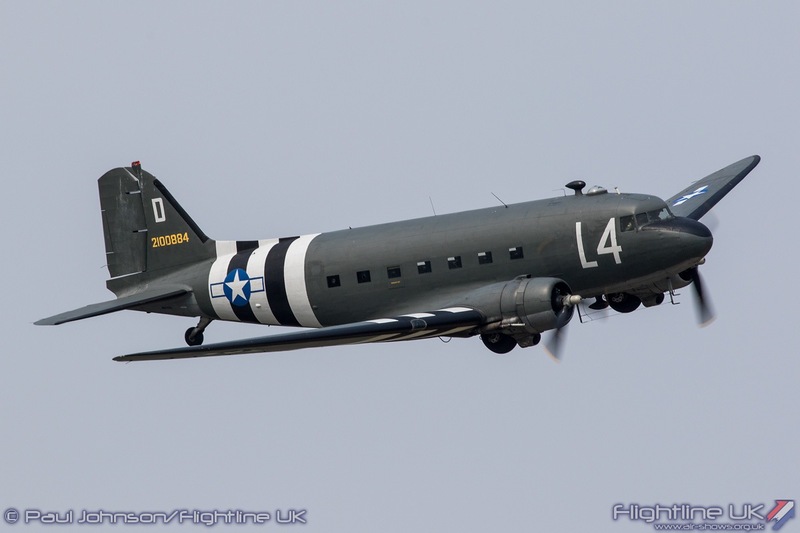 Today, Aces High are one of many companies based at Dunsfold with their collection of aircraft available to film producers which includes the C-47A. 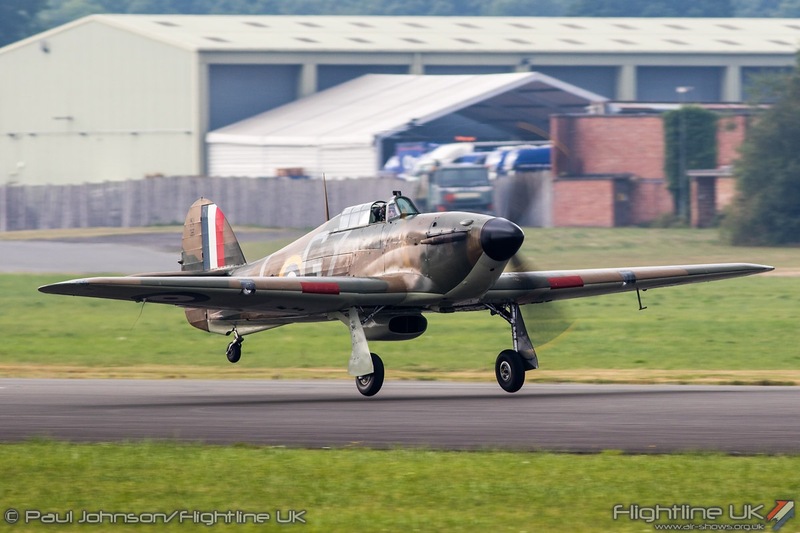 Dunsfold has regularly appeared on the big and small screen, notably in Casino Royale (as Miami Airport), the Da Vinci Code and World War Z.
Piston engined fighters were not forgotten. 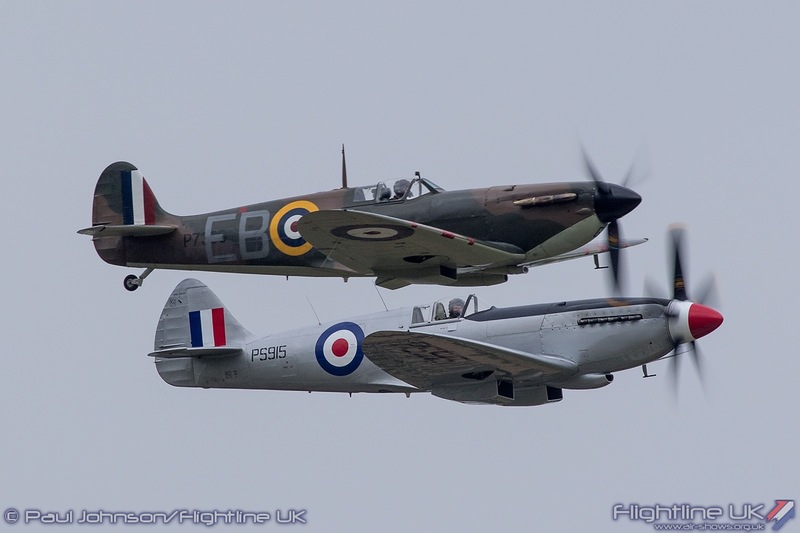 Peter Teichman displayed two of the Second World War most important fighters. 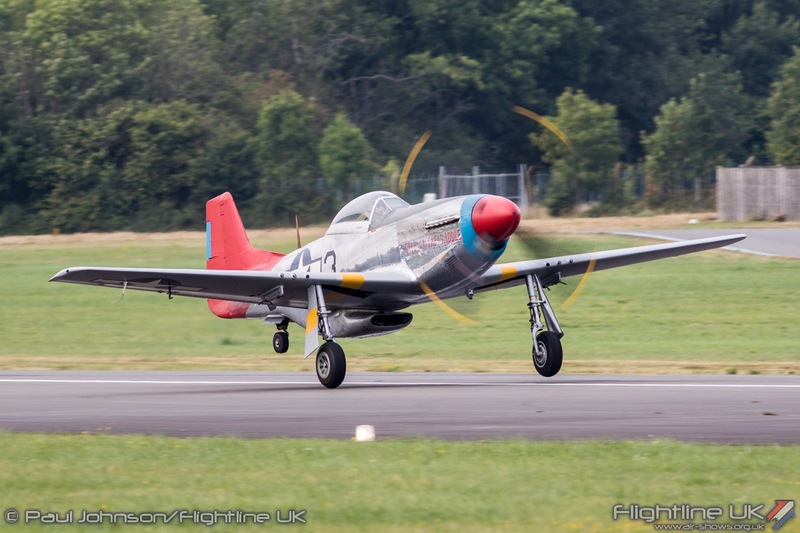 From his own Hangar 11 Collection came the beautiful North American P-51D Mustang which carries the markings of “Tall in the Saddle.” He also flew the Biggin Hill Heritage Hangar’s Hawker Hurricane I to mark the important contribution Brooklands made to the Second World War as a development base and factory for Hawkers and Vickers. 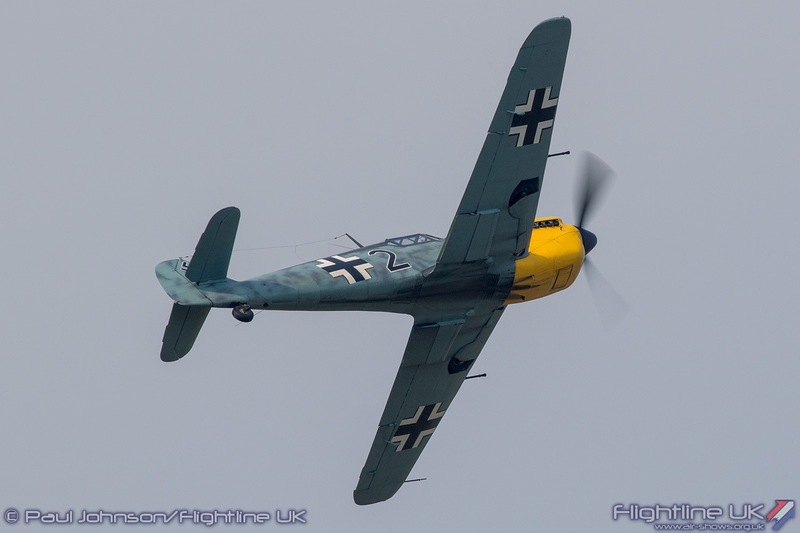 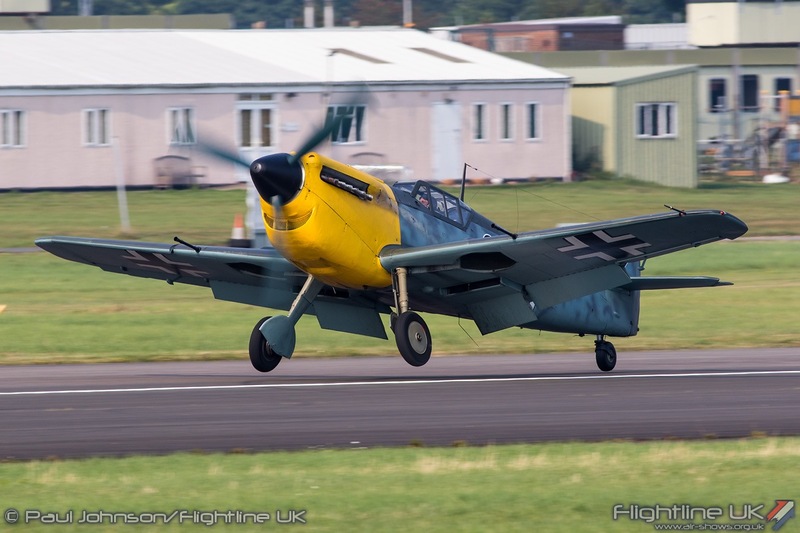 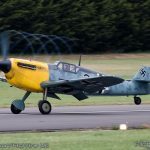 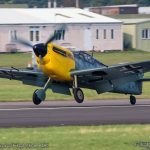 A new shape for Dunsfold was the Hispano HA-1112M1L Buchon from the Aircraft Restoration Company. 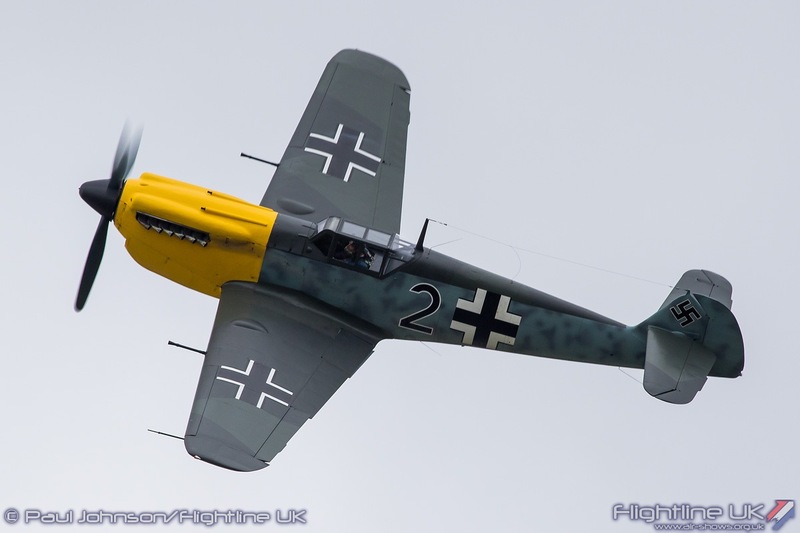 Buchons were Spanish built developments of the basic Bf109G fighter and served with the post-war Spanish Air Force. 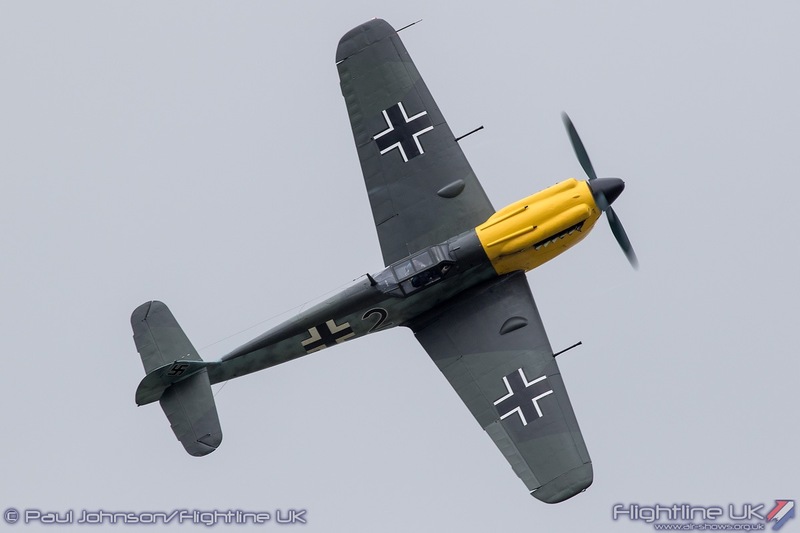 They were fitted with Rolls Royce Merlin 500s, but retained the classic looks of the Luftwaffe’s main fighter aircraft. 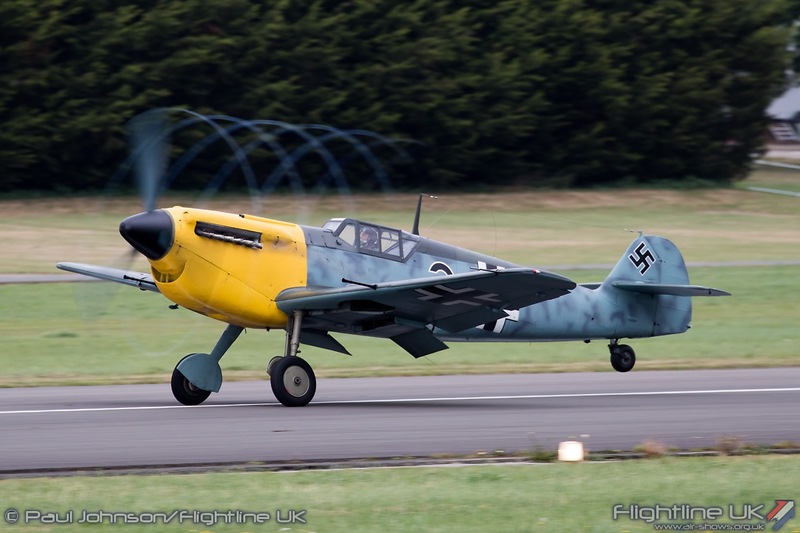 Like many Buchons, ARCo’s example flew in the 1969 film ‘Battle of Britain.’ At Dunsfold, it carried the temporary markings applied to the aircraft for the filming of ‘Dunkirk’, a new film by Christopher Nolan chronicling the Dunkirk evacuations in early 1940. 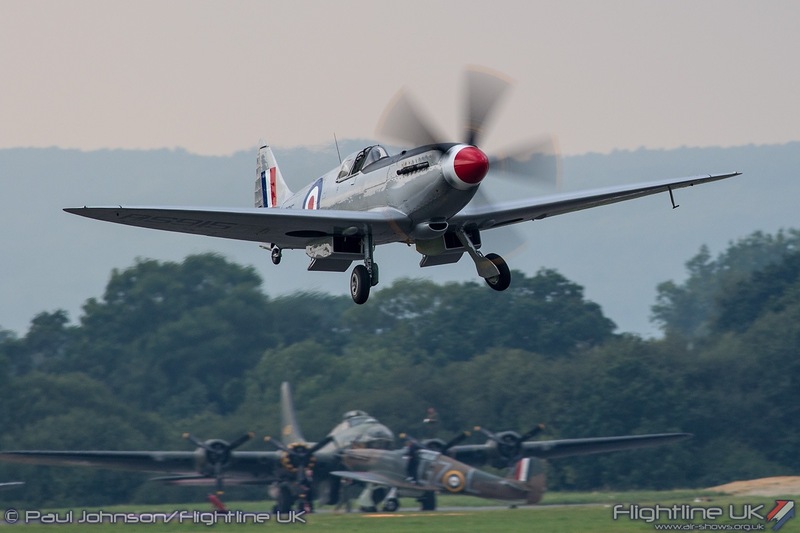 The Buchon was flown through a very smooth aerobatic routine by Steve Jones. 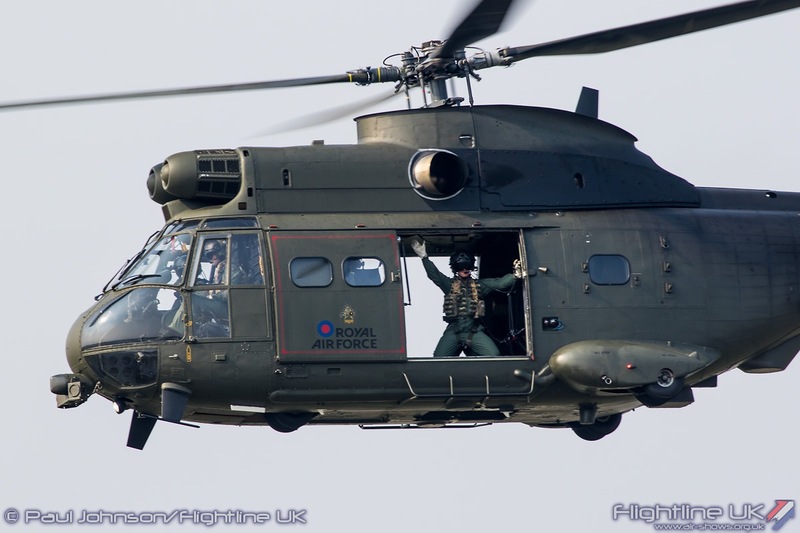 Adding the fun at Dunsfold were some great civilian displays. 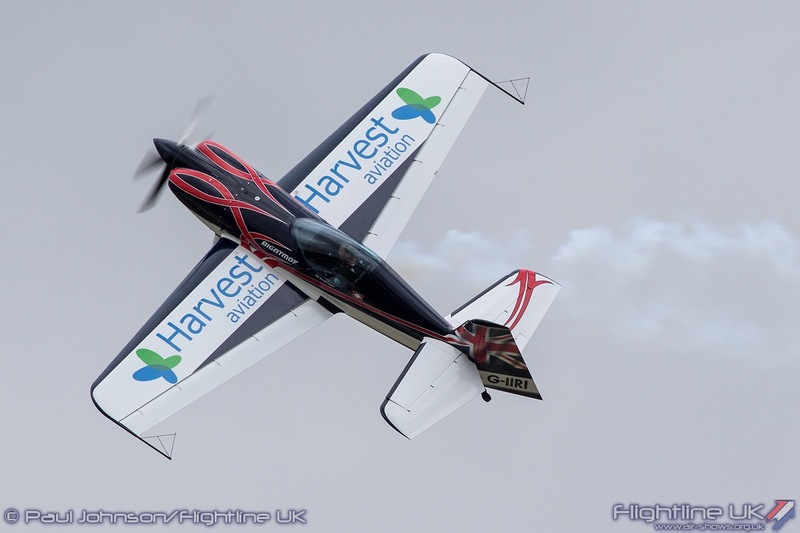 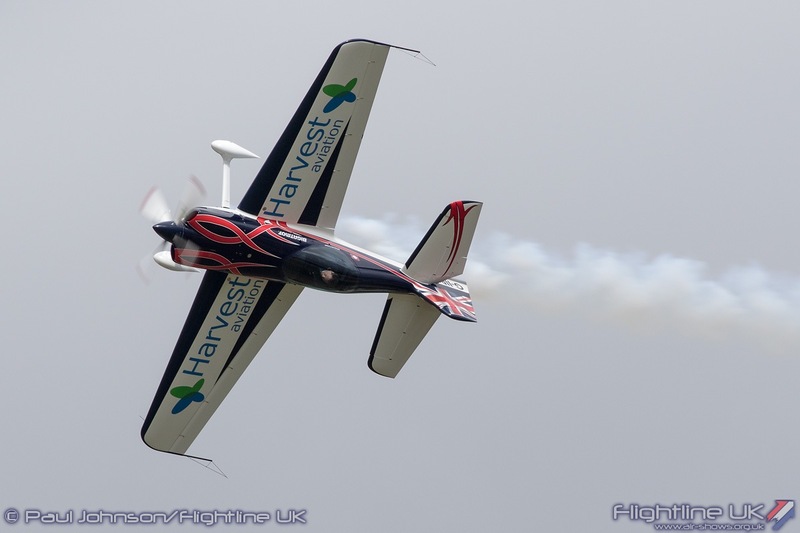 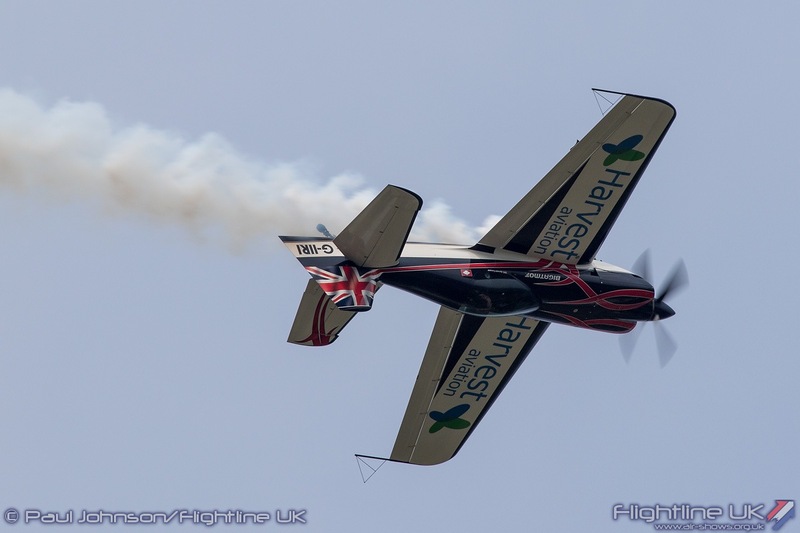 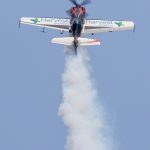 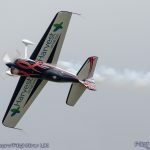 UK Aerobatic champion Gerald Cooper gave two superb freestyle aerobatic displays over the weekend in his XtremeAir XA41. 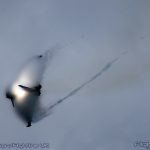 Gerald’s displays are breathless affairs with very few moments when the aircraft is not changing direction or rolling. 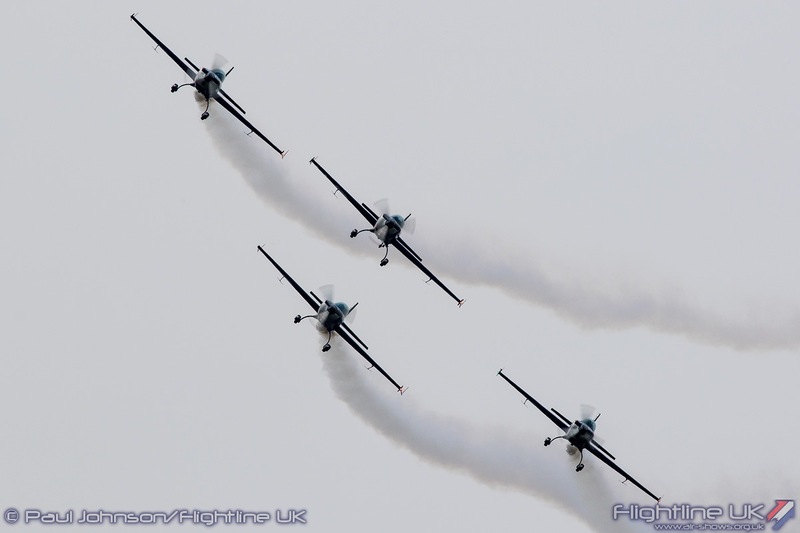 Further aerobatic spectacle came from The Blades Aerobatic Team with their usual mix of close formation and solo aerobatics. 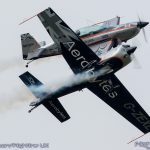 If there is one regular act that captures the spirit of Wings and Wheels then it is the Turbulent Display Team flying their diminutive D31 Turbulents. 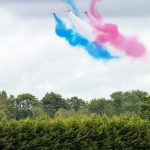 Their display is true ‘flying circus’ with formation flying, flour bombing, limbo-flying and balloon-bursting. 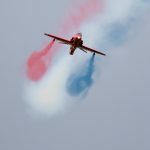 The display also involves a healthy dose of audience participation thanks to the double act of team commentator Sam Williams and Wings and Wheels’ own Brendan O’Brien. 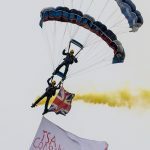 The ‘Turbs’ are always great fun and despite some inclement weather during their display on the Sunday still managed to raise a few smiles despite the grey skies. 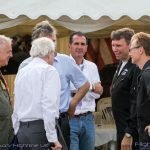 Wings and Wheels is always one of the most chilled, fun shows on the calendar and 2016 was no different thanks to the hard working volunteers and staff. 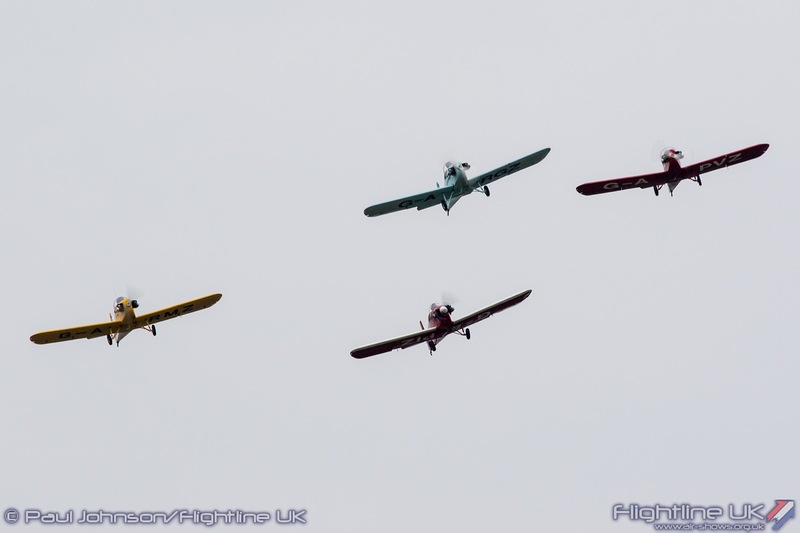 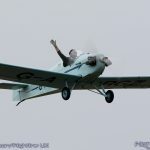 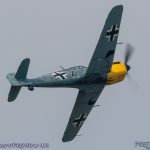 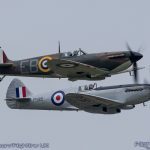 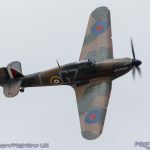 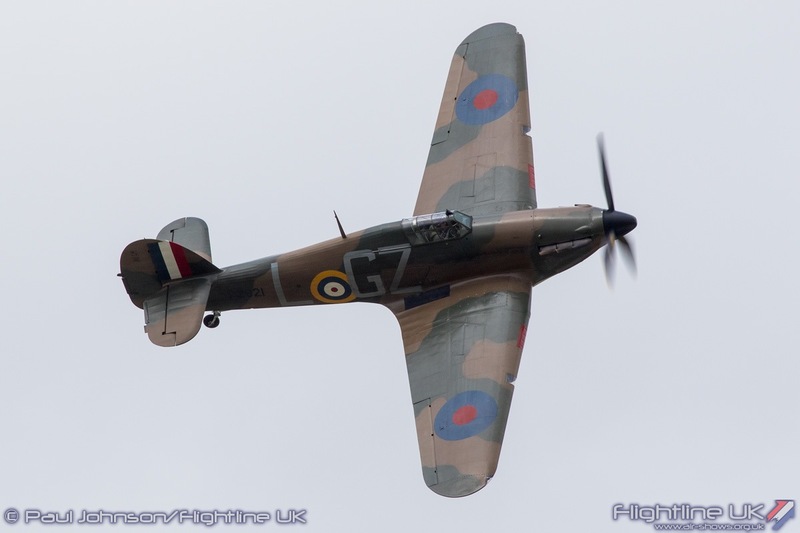 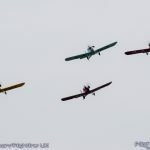 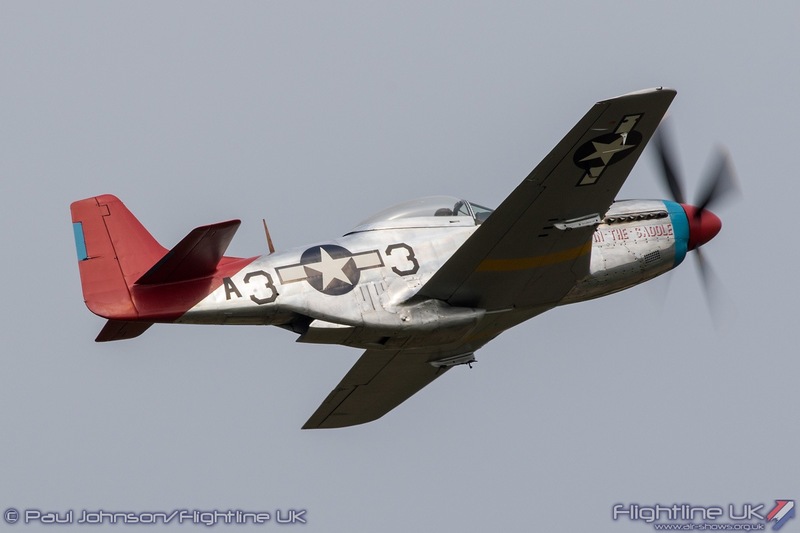 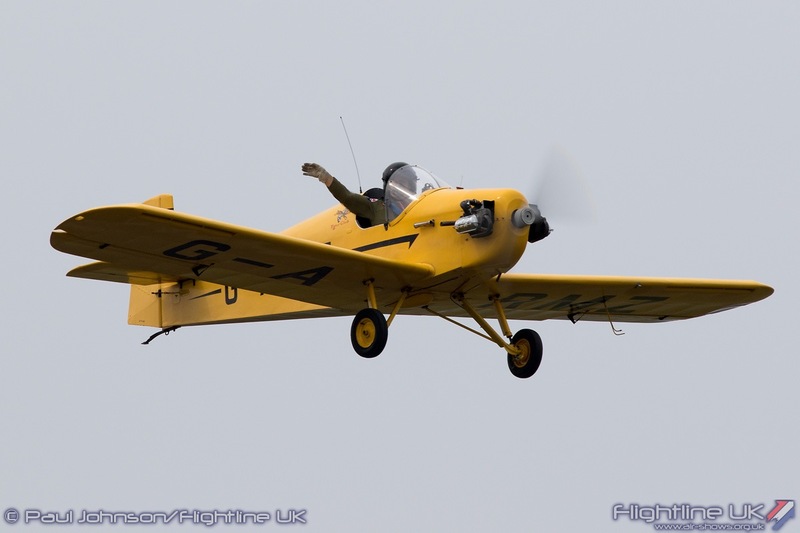 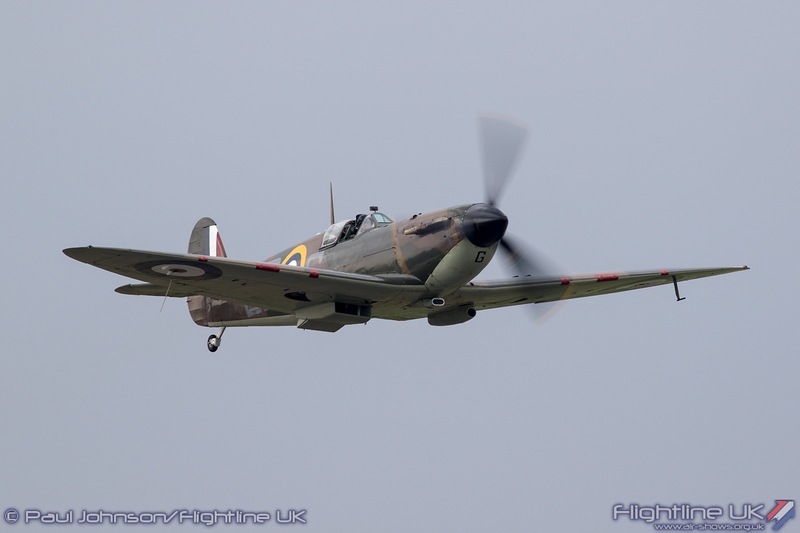 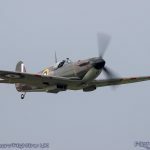 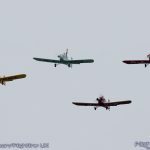 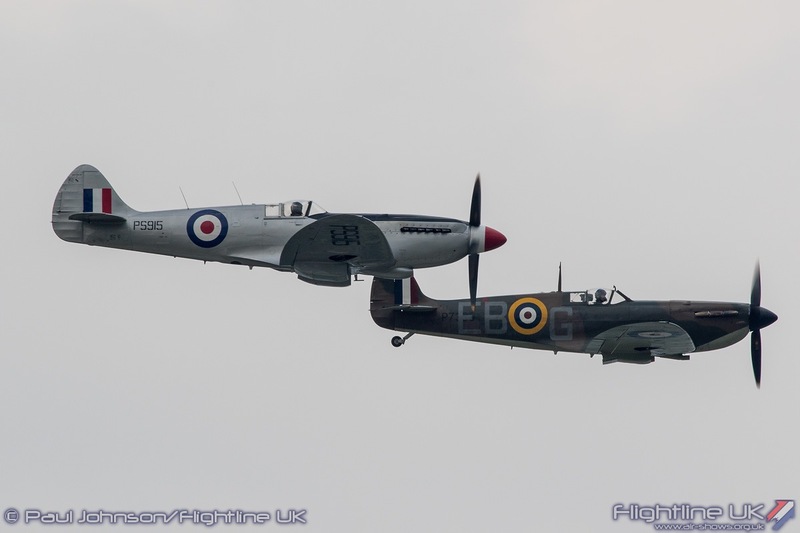 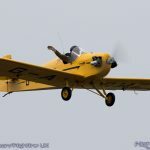 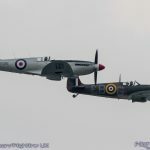 Credit must go to those in flying control and to the pilots for putting together a great afternoon of flying on both days despite the weather at Dunsfold and elsewhere, particular later on Sunday. 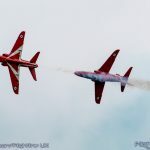 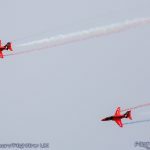 Thanks to their flexibility, only one display (albeit a big one in the form of the Red Arrows) was lost all weekend because of some quite extreme conditions at their operating base. 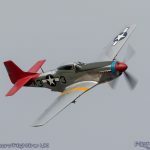 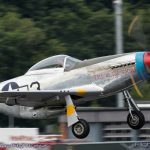 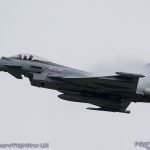 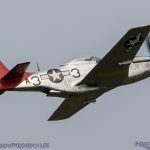 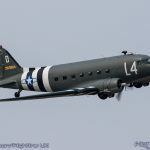 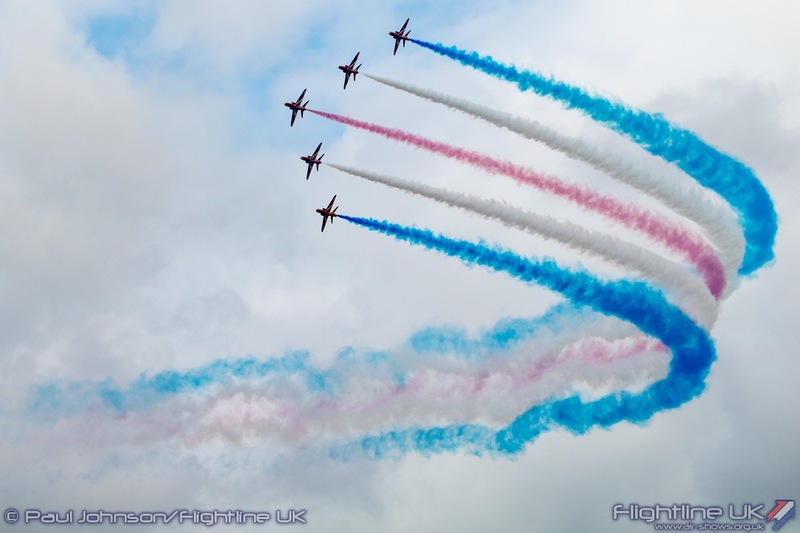 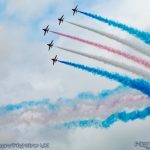 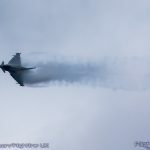 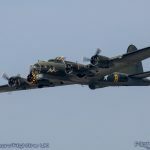 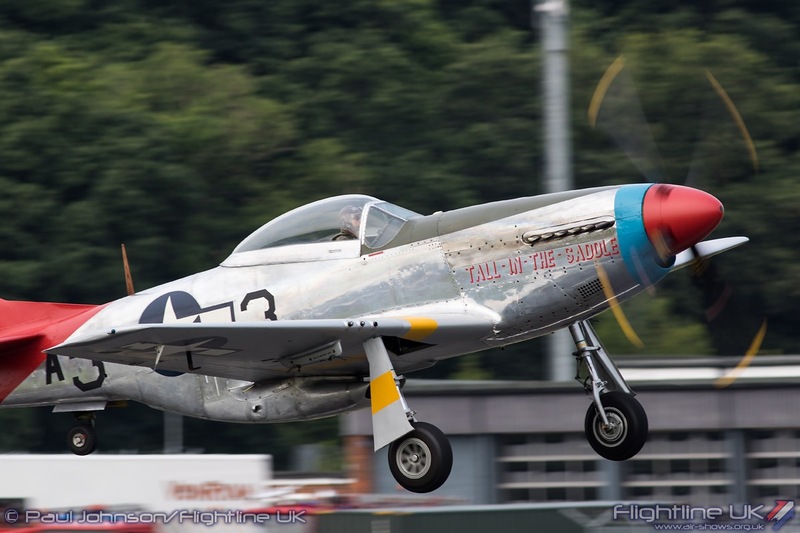 PreviousAIRSHOW NEWS: Air Tattoo’s USAF Tribute just the ticket!